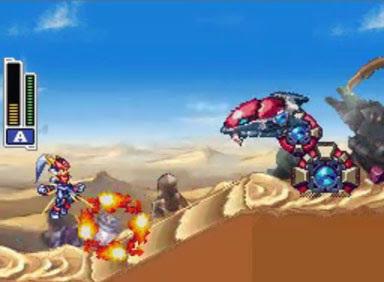 A game by Inti Creates for DS, originally released in 2007. The series started simply enough. 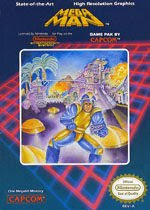 In 1987, the Blue Bomber made his debut on the NES with its now-famous atrocious box art. 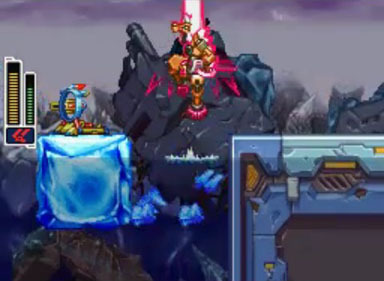 The original game established a number of the gameplay elements that would go on to define the series for decades to come, including multiple stages available at the beginning of the game, which could be completed in any order, and which opened up a final set of linear stages leading to Wily’s fortress. 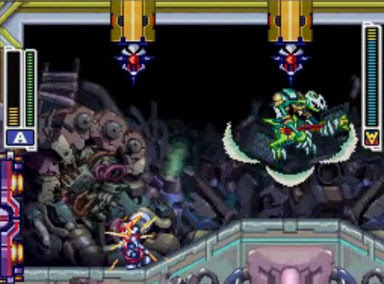 The title also introduced gameplay that allowed players to gain new abilities from fallen bosses, and then turn those abilities against other bosses who were weak against them. 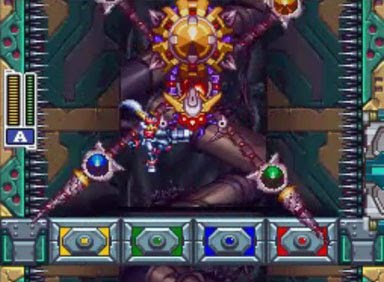 The original game had only 6 bosses, and there wasn’t a 1-boss-per-weakness system as there would be in the later entries in the series, but the core gameplay was there. 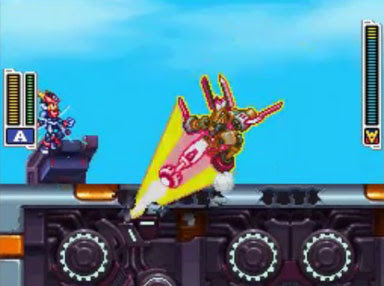 From there, new gameplay elements and tweaks were added with each sequel. The 8-boss standard was introduced in Mega Man 2, along with energy tanks and a password system. Mega Man 3 introduced two important recurring characters: Protoman, and Rush the transforming dog. 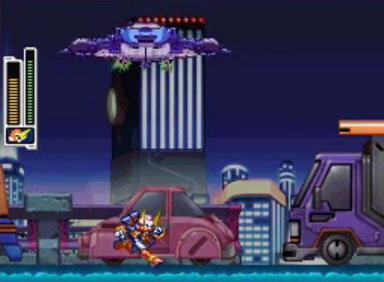 The game also marked the first time that Mega Man could slide along the ground, helping to make up for the fact that he was unable to duck. 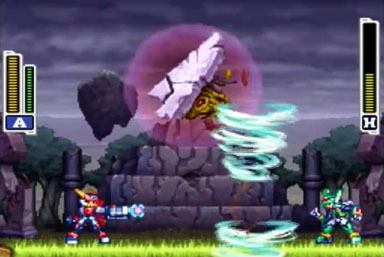 Mega Man 4 introduced the chargeable Mega Buster. 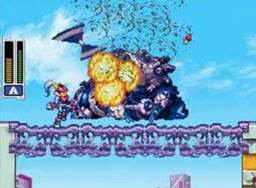 Mega Man 5 brought in a robot bird named Beat who could assist Mega Man and attack enemies. 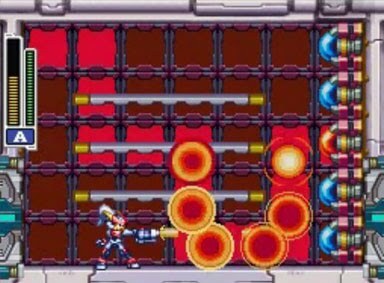 Mega Man 6 gave us the Energy Balancer, which distributed ammo pickups to the weapons with the least remaining, keeping players from having to manually switch between forms before grabbing pickups. 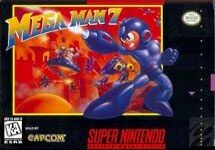 Mega Man 7 was the first entry from the core series to leave the NES. 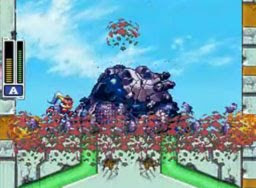 When Mega Man made his journey to the SNES, the standard 8-boss system was changed up a bit, forcing Mega Man to select between any of the first 4 stages before opening up the next 4. More importantly, the game introduced a currency system that allowed Mega Man to collect bolts and use them to purchase items and powerups in a shop. 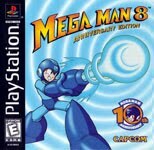 Mega Man 8 allowed simultaneous weapon use. Mega Man 9 was something of a return to roots for the series. Many of the modern changes and upgrades were dropped. 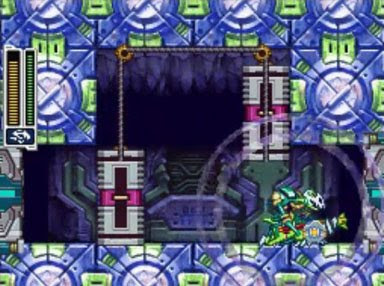 Mega Man lost the ability to slide along the ground and charge his buster, and once again all 8 bosses were available from the start of the game. 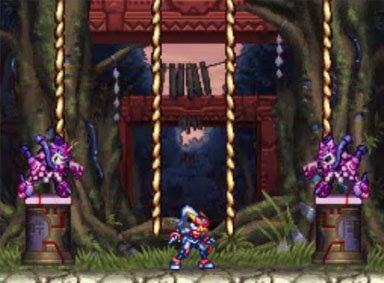 The game used the NES sprite art for the characters and environments, rather than the more detailed sprites from the SNES or PS1 iterations. Capcom even created some purposely terrible “box” art for the downloadable game. 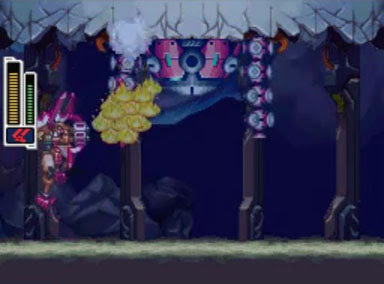 But not everything from the later games was tossed out; there was still a shop system, and players still had access to the transforming robot dog, Rush. 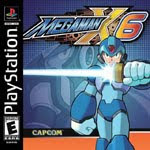 With the debut of X-series on the SNES, Capcom started a new series for the Blue Bomber, which led to a bit of confusion on the part of the consumer, particularly when Mega Man 7 was later released on the same system. 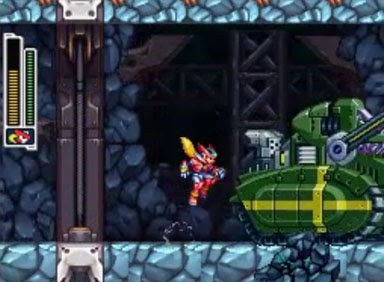 The Mega Man X series takes place about 100 years after the events of the original series, and focuses on Mega Man’s successor, namely Mega Man X, or just “X”. 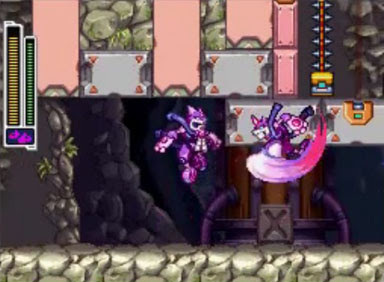 Major changes were made to the style, tone, and mechanics of the game to suit the story, and to appeal to an aging audience. 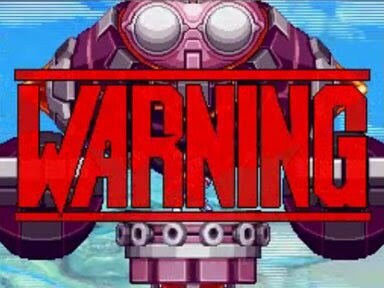 The Mega Man X series is centered around robots called Reploids, who have the ability to think and feel like humans. Some malcontented robots went “maverick” and started attacking people, leaving the Maverick Hunters to stop them. Drs. 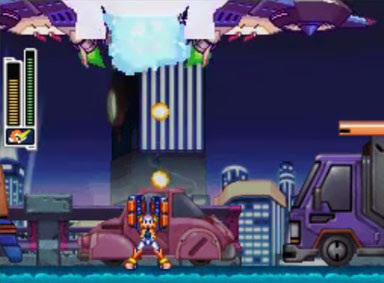 Light and Wily are long gone, with Wily losing his “big bad” position to Sigma, and Dr. Light’s participation relegated to holographic projections and pods left behind for X to download new abilities. Here again, there are 8 selectable levels, each with their own end boss. 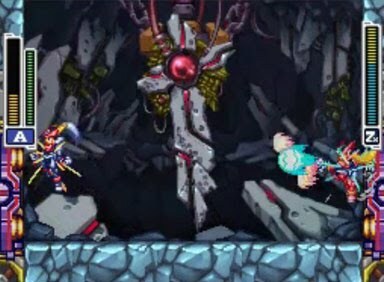 Killing these bosses not only unlocks new abilities (to be used against other bosses), but also makes changes to the environment as well, altering the climate or other factors, and sometimes opening up new paths to hidden items. 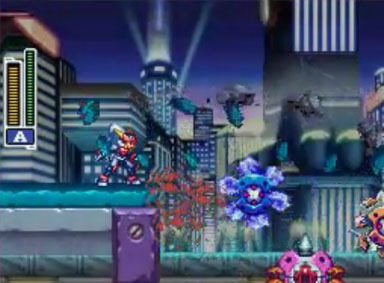 X also has upgradeable armor and parts that grant him new abilities, which would go on to become key in later Mega Man games. 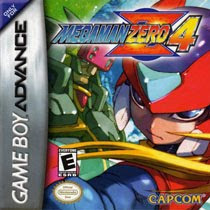 The series is also important for introducing Zero, the sword-wielding robot with long blonde hair. 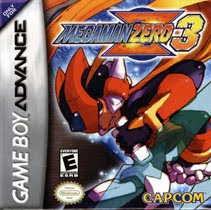 Mega Man X3 marked the first game where Zero was a playable character, and he would eventually go on to star in his own series. 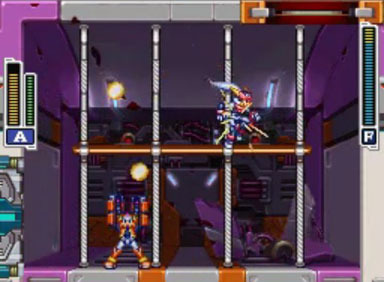 Gameplay in the Mega Man Zero series – developed by Inti Creates rather than Capcom – is similar to that of Mega Man X, as Zero has a number of the same moves as X, including dashes and wall jumps, and he also makes use of his signature sword-like weapon, the Z-saber. 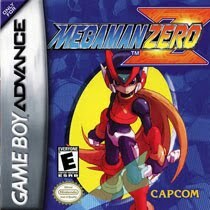 Zero fights to defend the last of the Reploids as humans move toward wiping them out. 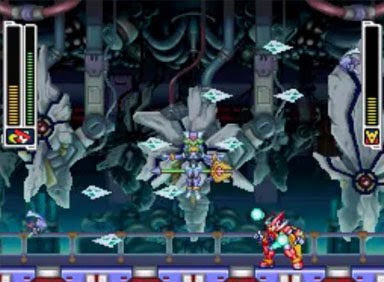 As per Mega Man standards, Zero earns new abilities by defeating bosses, but the challenge is increased by the implementation of a ranking system that offers additional rewards for better gameplay. 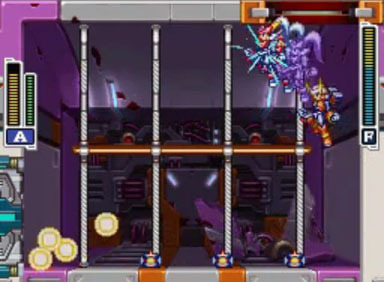 The game also introduced the Cyber Elf system, whereby Zero can receive modifications to this abilities – and even to the environment – by implementing the skills of Cyber Elves (but using them detracts from the player’s ranking somewhat). 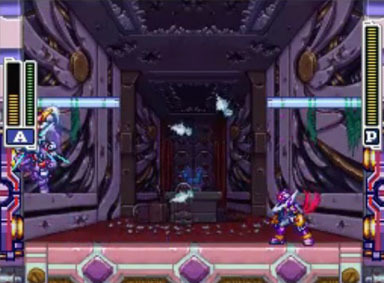 That brings us up to the Mega Man ZX series, which was also developed by Inti Creates. We’ve left out several entire series of Mega Man games as part of this discussion, but these are not part of the ZX chronology. 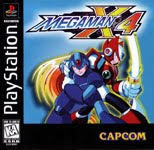 The Mega Man ZX series is based upon the foundations of the original game series (Mega Man), the Zero series (Z), and the X-series (X), which together make up the Mega Man ZX title, as well as the titular character’s abilities. 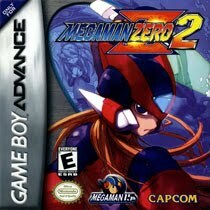 The ZX series takes place 200 years after the Zero series, in a time when the line between humans and Reploids has been blurred. 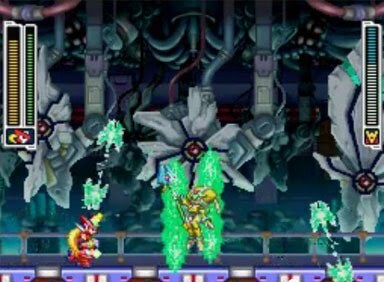 Reploids have been given artificial lifespans, and humans have begun modifying their bodies with biometals, giving them the enhanced abilities of Reploids. 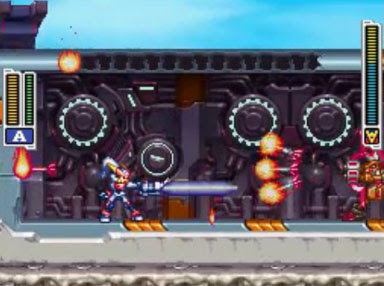 Some of these biometals contain the essence of the legendary heroes of the past, including Mega Man and Zero. 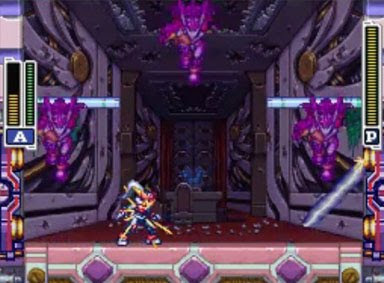 In Mega Man ZX, rather than controlling robots, you take control of a human (a male or a female) who can MegaMerge with biometals to take on the combined abilities of Mega Man and Zero, and new abilities are gained by defeating bosses. 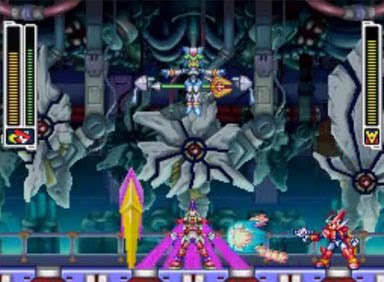 You must fight against Reploids based on the designs and abilities of The Four Guardians from the Zero series, each of whom share the first letter of their names with the original guardians. The player is able to switch between these armors at will to make use of their various elemental abilities, and he can return to human form, allowing him to reach otherwise inaccessible areas by ducking, crawling, and swimming. 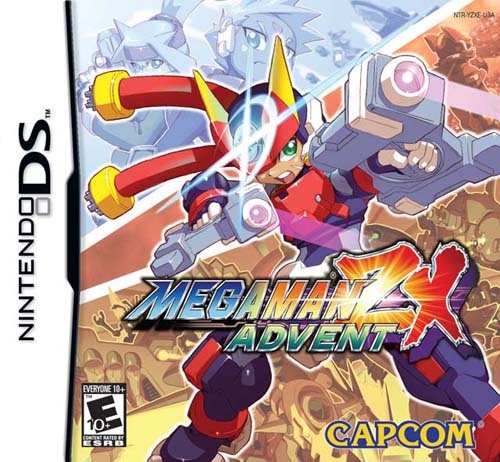 The second game in the series, Mega Man ZX Advent, takes place a few months after the first. 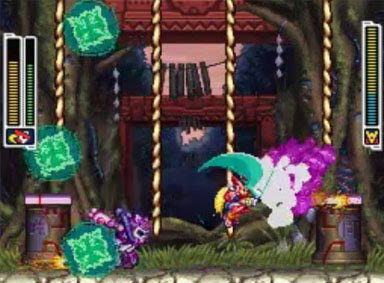 Here, the player not only faces off against four super-powerful biometal-equipped Mavericks (once again based on the powers of The Four Guardians), but he must also face new creatures called Pseudoroids. 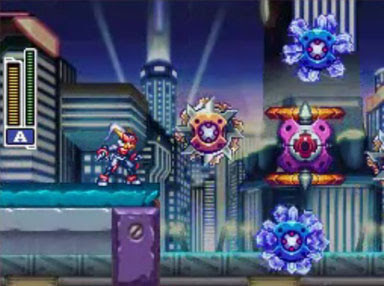 Unlike previous games in the series where Mega Man simply gains new abilities and/or new armors, defeating a Pseudoroid allows Mega Man to physically take the form of the defeated boss, with unique controls and abilities for each, thus setting it apart from its predecessors. The future… where science and technology have evolved far beyond our wildest dreams. 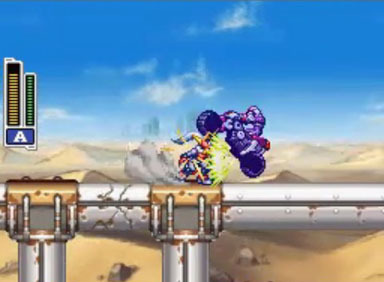 The long, drawn-out war between the Humans and their mechanical creations, the Reploids, had finally come to an end. The two coexisted peacefully in this high-tech world. The Federation Government, Legion, was established following the war. 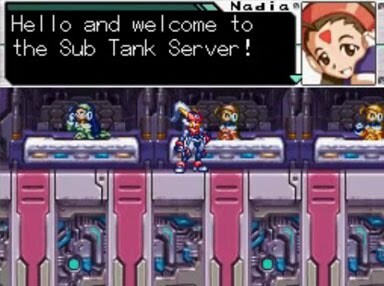 It was an organization responsible for presenting Humans with cybernetic modifications and assigning artificial life spans to Reploids, blurring the lines between man and machine. The two populations, with their destinies more intertwined than ever before, began to found fledging nation-states around the world. A new era of history had begun, and several centuries had passed since the war. Old ruins from the previous age were scattered across the globe and became homes to the feral machines known as Mavericks. However, these dangerous areas were also the final resting places of many powerful lost technologies created as a result of the many years of conflict. One entrepreneur took advantage of this buried treasure of cutting-edge technology and used it as a base for forming one of the world’s leading corporations. Soon after, people with dreams of getting rich quick, the Hunters, formed the Hunter’s Guild to seek out the wealth lying within the ruins. The temptation of this technological windfall was too much for some, who refused to join the guild and instead sought the hidden riches all for themselves. These people were called Raiders. In the great Tech Rush, everyone seemed to forget that this buried technology was designed for only one purpose: WAR! 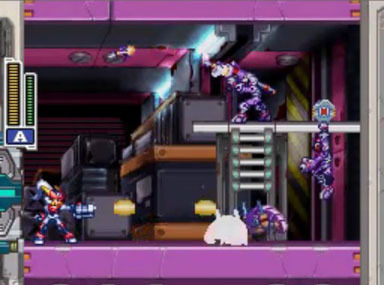 Fans of the Mega Man series will find a lot of familiar territory here, as player movement is very similar to the previous games in the X and Zero series. However, there is one important difference… You are not technically playing the part of a Mega Man. 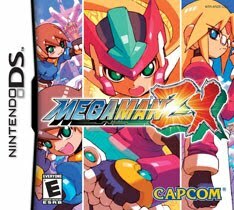 At the start of the game, you get to choose between either a human female or a male Reploid character (as mentioned above, humans and Reploids have become virtually indistinguishable at this point in the Mega Man continuity). 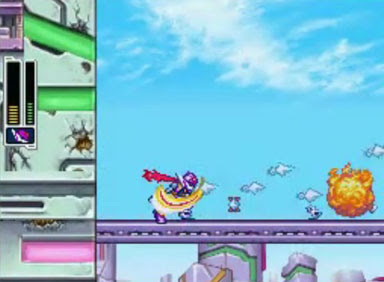 These characters do not have any super powers, and have only basic platforming movesets. They each have a weak gun, as well as the ability to swim, and to duck, but they can’t perform any of the moves that you’re used to seeing from Mega Man until they “MegaMerge” with a biometal. 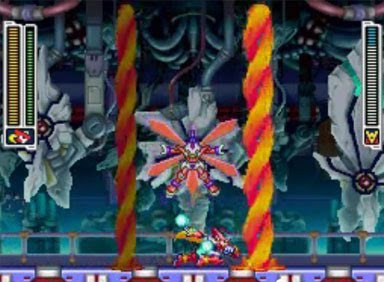 The Mega Man ZX universe centers around biometals. 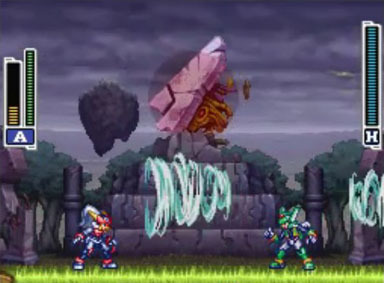 These are artifacts that grant normal humans and Reploids enhanced abilities. In the first ZX game, the player discovered both the Model X biometal and the Model Z biometal, granting the abilities of Mega Man X and Zero. 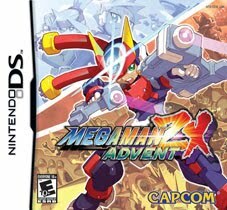 Mega Man ZX Advent, however, the protagonist discovers a new biometal – Model A – which grants him/her some of the standard Mega Man abilities, as well as the ability to take on the forms of defeated foes. 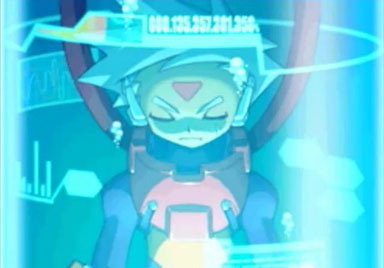 Another thing to know is that the biometals are sentient, so dialogue sequences frequently take place between the human/Reploid character and the biometal. The Model A biometal is fairly immature not terribly brave, and it is up to the hero to convince Model A to go into battle. So, while the protagonist and his “armor” are technically separate characters, we’ll be referring to them in combination as “Mega Man” for the duration of this article. 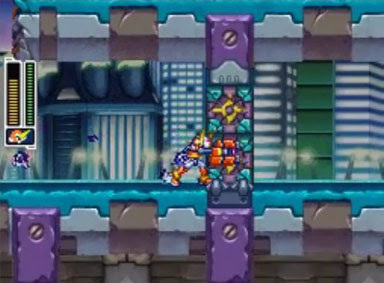 All MegaMerged characters are referred to as “Mega Men” in-game as well. 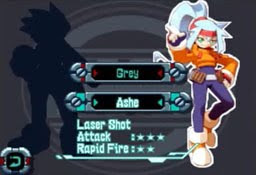 Grey and Ashe have slightly different abilities in their Model A forms, and there are very few differences in the new forms that they attain later in the game. 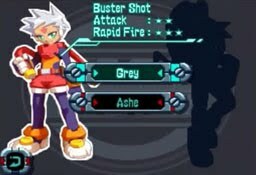 Grey has a standard Mega Man buster shot which allows for 3 shots on the screen at a time, whereas Ashe has a laser shot with slightly longer and more powerful projectiles that fires more slowly, and only 2 projectiles can be on the screen at a time. 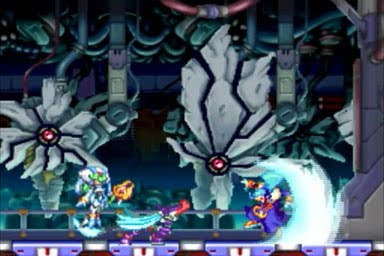 Grey’s charged shot again mimics that of Mega Man, unleashing a more powerful wide burst (there are 2 levels of charge), whereas Ashe will fire off a longer bouncing laser. Each character has a sub attack. 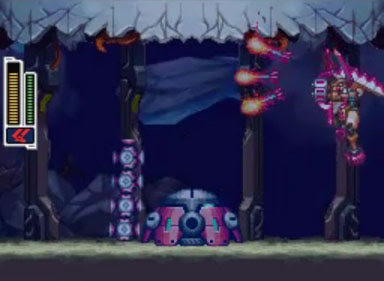 Grey can lock on to up to 8 targets and launch a barrage of homing missiles. 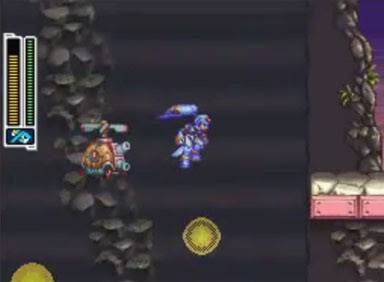 Ashe, on the other hand, launches an electrical attack that arcs between multiple enemies. 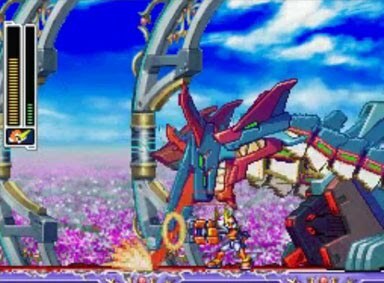 The characters also have a Giga Crush attack which depletes the entire biometal gauge and causes damage to all enemies in a limited range. 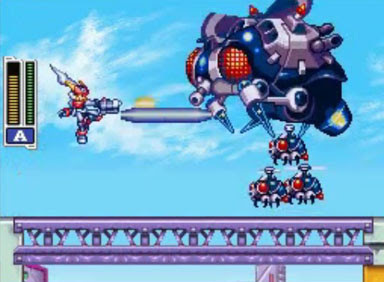 The Model A form – and most of the humanoid forms – has a variable 1x jump, which is a bit low by platforming standards, but on par with the rest of the Mega Man series. 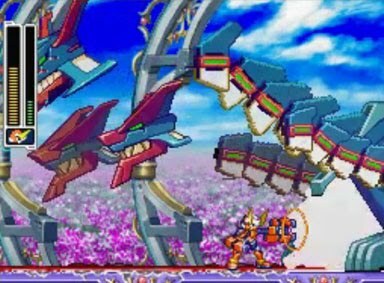 As usual, it is up to Mega Man to defeat bosses and acquire new forms that allow him more versatility in his movement and attacks. Oh, and just as in the original Mega Man ZX, switching to the Model A biometal removes your ability to duck or crawl. 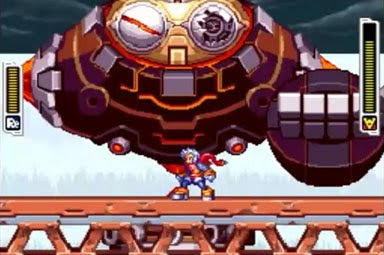 Even after hundreds of years, Mega Man still cannot duck, but the developers are at least acknowledging this fact by allowing your human/Reploid character to do so. The game starts off with a bang, offering a mix of hand-drawn and in-game cinematics to introduce Ashe or Grey, with full voice work during these sequences. There is some voice work during the game itself for the more important cutscenes, and there are a few hand-drawn sequences later as well. The voice work is average, but it’s a step up from the previous game which did not offer localized vocals for the Western release. The opening sequence for the two characters is very different, and establishes their back stories, but each of them eventually ends up at the Hunter’s Camp, which is the primary center of operations. There are some differences in their stories as the game continues, but these differences fall outside of the gameplay. 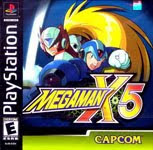 The story has never been a primary focus in the core Mega Man series, and has generally taken a back seat to the action. All the player has ever needed to know is that a big bad guy has 8 robots that need to be destroyed. But the amount of time spent in storytelling has grown with each generation, and you can expect a number of long dialogue sequences, moody characters, and a maniacal bad guy who regularly feels the need to espouse his superiority. 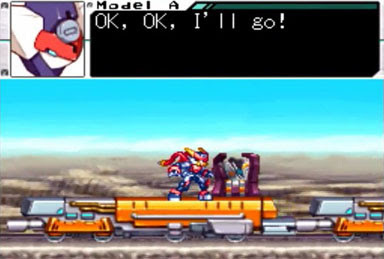 The basic story is that the bad guy is attempting to activate the Model W Mega Man (The ‘W’ in this case is a reference to Dr. Weil from the Mega Man Zero series; in Japan, this is Model V in reference to Dr. Vile). 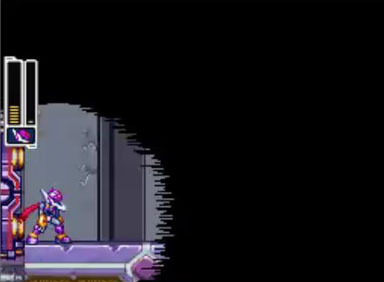 All of the other Mega Men are supposed to be fighting each other in the “Game of Destiny” until only one remains to become king of the world. While this is going on, the protagonist is trying to determine the origin and the meaning behind the Model A biometal. 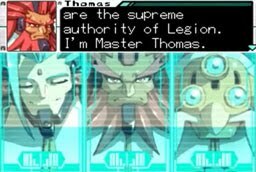 A group of wise men called Legion has members named Thomas and Albert, named for Drs. 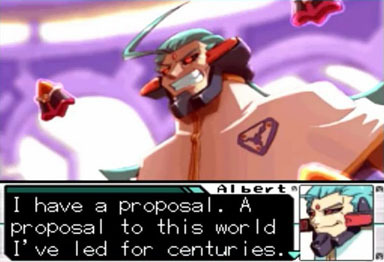 Thomas Light and Albert Wily from the preceding series. In the end, the elongated story is little more than an excuse to go after the bad guys and solve your problems with violence. You also will meet some NPC’s along the way who offer optional side quests with a number of possible rewards. Most of these are simple fetch quests, but some of the rewards can be quite helpful to your progress (these are covered in the Special Items section below). There are also several NPC’s who will open up new optional areas for a monetary contribution. 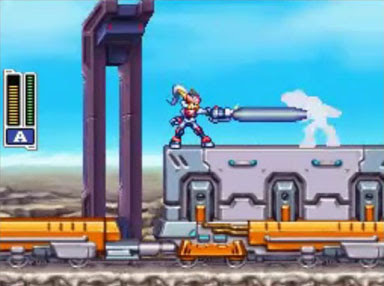 Mega Man starts out with an average-length life gauge. Once the Model A biometal is acquired, an equally-sized biometal gauge (which is rather sadly referred to as the BM gauge in-game) will also appear, which is depleted when he uses his special abilities. 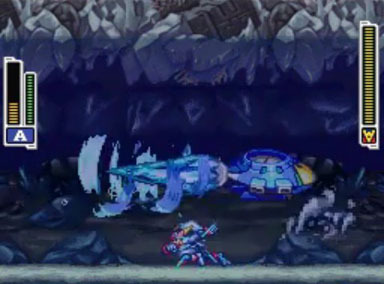 As with previous Mega Man games, there are several sizes of Life Energy capsules that can be found in the environments and dropped from enemies, allowing you to replenish some of your health or fill sub tanks. Small ones refill 4 units, medium ones refill 8, and large ones fill the meter back to the max. 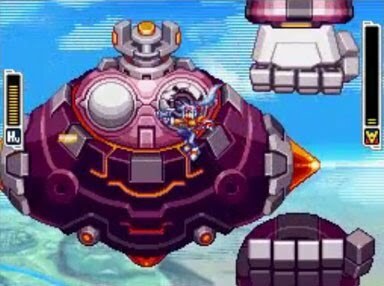 There are also small and large BM pickups that restore Mega Man’s BM gauge, but in this game, your BM gauge replenishes itself over time. 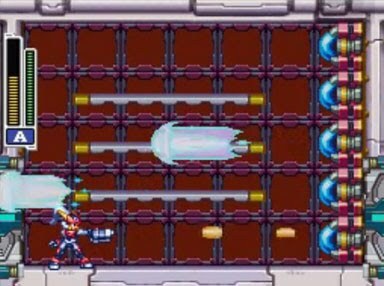 This has two consequences on the standard Mega Man formula: It keeps you from having to farm enemies to refill the gauge, but it also makes BM pickups largely useless. 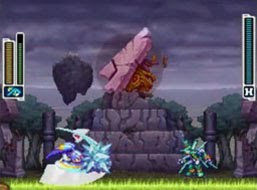 In addition to health and BM restoratives, you will also encounter E-Crystals (EC), which are the game’s currency. These also come in small and large forms, with smaller ones (worth 4 EC) dropped from enemies, and larger ones (worth 16 EC) dropped by tougher enemies or found in the environment. Any of the larger pickups can be broken open as long as you have a bladed weapon. When you break open a large pickup of any kind, it will turn into 4 smaller pickups of all 3 sorts. This allows you to turn the useless BM pickups into money or health at will, and helps you to farm for whatever pickup you’re after. As per series conventions, enemies respawn infinitely when they’re scrolled off the screen, which is great for farming, but it becomes a bit more punishing in a game that has an increased focus on exploration and backtracking. There are a few well-hidden permanent health and BM upgrades (4 of each) in the environment, as well as the series-standard sub tanks, which allow you to carry reserves of energy. Hunting these down early in the game will help you to get the upper hand in some of the more difficult boss encounters. Per usual, depleted sub tanks can only be filled by grabbing health pickups; only your main health gauge is restored at save points. Sub tanks will only be filled when your main health bar is completely full, after which the energy will be transferred to one of the tanks. This also means that even if you are only down by 2 units, grabbing a large pickup will just restore your main meter, and will not overflow into your sub tanks. 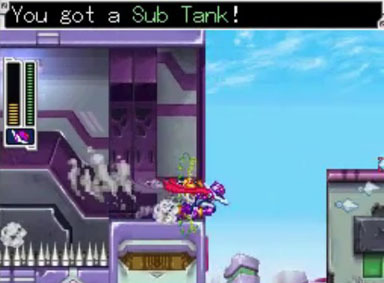 Energy from sub tanks may be used by selecting them from the pause menu, and each holds a maximum of 30 units of health. There is also an E-Tank in the game that allows a one-time full health restoration, but you have to buy another once you use it, and they’re fairly expensive… so it’s best to hold on to it for the last desperate moment. Lastly, there are 1UP icons, which may seem a bit odd in a game where you have save points and infinite continues, but there are a number of situations where you are required to beat several levels in a row before being able to return to a save point. Each time you die, you’ll restart at the last door you came through, and keeping a few extra lives on hand may prevent you from having to load up a save. 1UPs are farmable as well, and your life count maxes out at 9. You will be restored to 3 lives if you reach a save point with fewer than that. There are several optional pickups as well, the most abundant of which are Data Disks. These disks are mostly used to supply a gallery-style view of each of the enemies and bosses you’ve encountered, although there are a few special ones as well that have images of NPC’s and even one that shows the box art from the original Mega Man on NES. Disks are tucked away in the environment, but most are not so well hidden as the permanent upgrades or sub tanks. Featherweight - There are some surfaces in the game that you will sink into if you stand on them, and some platforms that will crumble and fall away. With this item equipped, platforms will not crumble and the sinking effect will be negated. 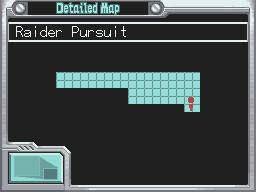 Be aware, however, that there is at least one point in the game where you will be required to sink down in order to progress, so you’ll need to unequip the item in the pause menu. Ice Boots - Prevents Mega Man from sliding on icy surfaces. Frog - This oddly-named pickup slows down the speed at which Mega Man slides down walls. 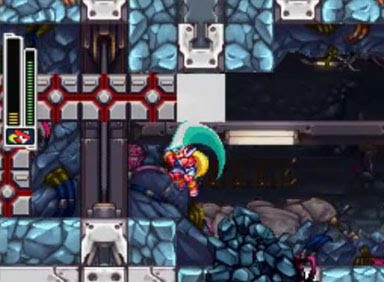 This is particularly handy if you’re trying to launch some charged buster shots at a boss from an elevated position, because you’ll have more time to charge up before sliding back down to the ground. Absorber - Keeps you from getting knocked back when you take damage. This is an especially nice item to have equipped when you’re jumping between lots of small platforms while fighting enemies. Soccer Ball - This odd powerup turns your bombs (in Argoyle form) into soccer balls… sounds like something out of Bangai-O Spirits. Eraser - Lets you destroy projectiles with bladed weapons. 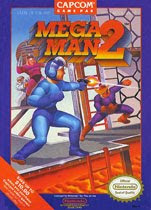 Fans of the Mega Man series will recognize a number of series staples as they make their way through the game. 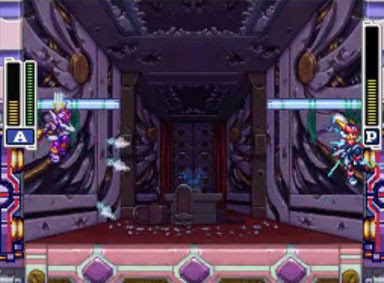 For instance, doors leading to boss rooms look different than standard doors, with a circular design at the center that spins and unlocks before it opens like in Mega Man X, and boss fights are preceded by an empty room with these doors on either side, which is standard for the series. 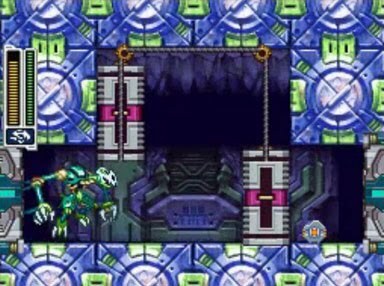 The game also pauses while the door goes through its unlocking sequence and the screen slides over to reveal the new room. 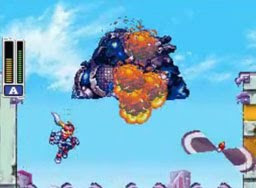 If Mega Man was airborne at the time, he will remain hovering in the air while this transition occurs; if he was running, he will continue to cycle through his running animation, just as he has done since his original NES outings. 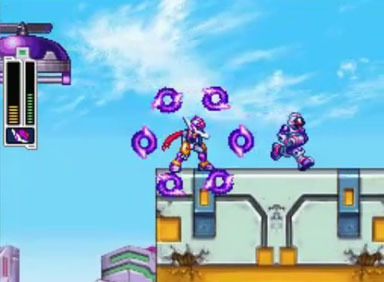 The design of the health and weapon pickups has remained steady throughout the series, and as in the previous entries, the game will pause for a moment when Mega Man grabs a health pickup and health units are added back to the meter. 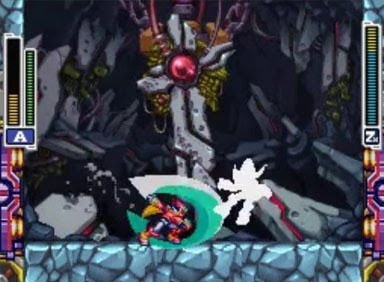 The pause effect lasts for as long as it takes to add the health units, with larger pickups pausing the game for a longer duration, or until Mega Man’s health reaches it max. Some familiar enemies return as well, including the Mettaur (the little miner helmet guy who pops up to take shots at you). 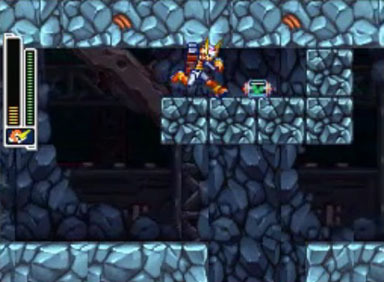 Spikes still kill Mega Man instantly, and there are plenty of places – particularly those surrounding hidden items – where Mega Man must navigate spike-laden passages to reach his destination. 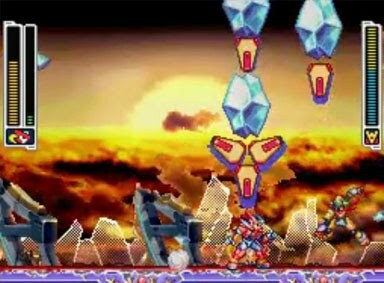 Touch the spikes, and Mega Man will suddenly explode into several energy balls that extend outward, punctuated by the familiar death sound. 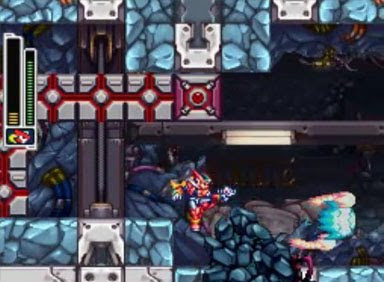 As with the first Mega Man ZX game, there is some nonlinearity, but it comes in spurts. For instance, after the opening levels where you receive the Model A biometal, you have a choice between two different paths, each with their own boss. But, all other paths are closed to you until you defeat them both. 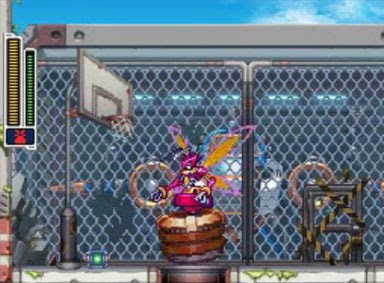 Throughout the game, you’ll reach these milestone points that open up several new areas at once, which can be played in any order. As such, you can’t just pick any path from the start and go, as in the early Mega Man games, but you will often be given the choice between 2-4 levels that can be played in any order. 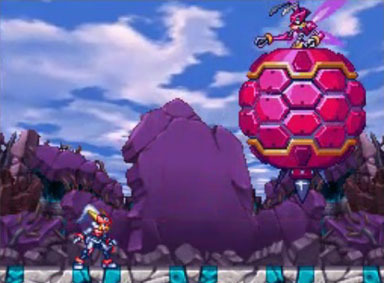 The world map in Mega Man ZX Advent is much improved over the original Mega Man ZX. This time, rather than a bunch of seemingly unrelated areas scattered about, each set of related levels is connected on the map, giving you a basic idea of their layout. For instance, a set of 4 vertically-aligned levels means that you’ll to be climbing upward, whereas the horizontal levels indicate either left-to-right or right-to-left movement. 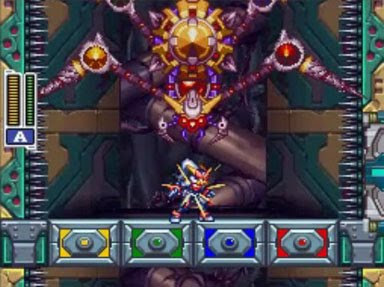 Most levels appear in sets of 4 with a miniboss at the halfway point and a full-blown boss at the end. Sometimes you have complete freedom to move forward and explore levels, and then return to the Hunter’s Camp to save your game, allowing you to take a more hit-and-run approach to the levels. 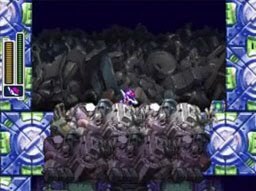 Other times, you’ll find yourself locked in a section where you must complete all 4 sections and beat the boss(es) before you can escape. 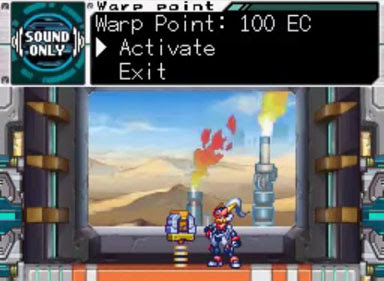 Spread throughout the game (usually one at the beginning of each section) are teleportation points that you can activate, for a cost of 100 EC each. These are 1-way teleporters, so you can’t use them to escape the level; they’re only used so that you can return to that place in the level from a save point. This keeps you from having to repeat large sections of the game if you wish to return to an area to explore it later. You’re free to jump to any activated teleportation point from the few save points spread around the world, allowing you to quickly backtrack to almost any level in the game. This is particularly useful when you’re performing fetch quests for NPC’s, and also for when you earn a new ability and you wish to return to a previous area to try it out. The map is easy to navigate via the touch-screen, allowing you to drag it around to view different areas and select a teleportation point. Within the levels themselves, you can switch from the “overworld” map to see a blown-up map of the area you’re currently in, with a full screen-by-screen layout that also shows the locations of any exits. 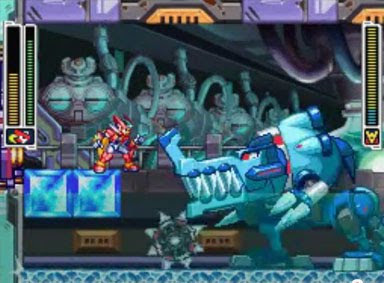 The Mega Man series has always had a strong focus on its boss encounters. 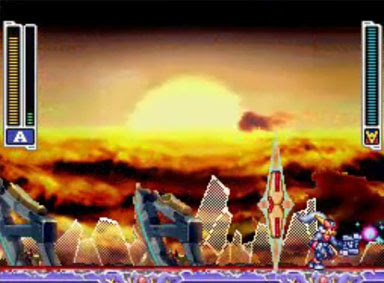 Historically, selecting a stage would kick off a cinematic sequence where the boss is introduced and allowed to pose in a semi-menacing manner. Then, it was a matter of figuring out which boss to take down with your default weapon so that you could gain its enhanced abilities and use them to take down the boss weak against the ability, with some experimentation along the way to figure out which is which. 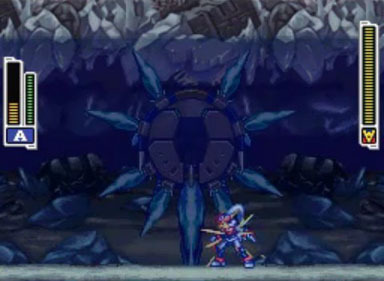 Mega Man ZX Advent does not introduce posing bosses at the beginning of its stages, but if anything, the game is more focused on its boss encounters than in any other entry in the series. 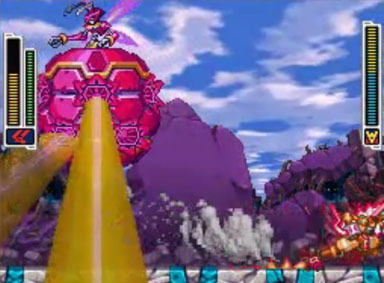 And the fact that some of the bosses allow Mega Man to take on entirely new forms means that there are more nuances to the level-to-level gameplay than ever before. The game is positively loaded with boss encounters. There are 13 “standard” boss encounters (see BOSSES section below) where you face off against Psuedoroids as well as biometal-equipped Mega Men, and earn their powers upon defeating them. 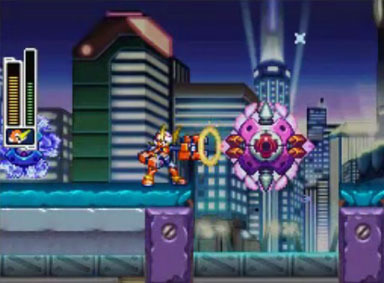 However, in most Mega Man games, equipping the power of your defeated enemies simply changes the color of Mega Man’s suit and allows him to fire new types of projectiles. 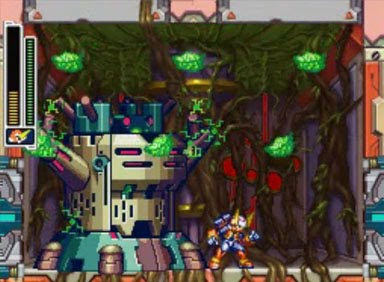 Not here… When you select one of these acquired powers, Mega Man is physically transformed into the defeated boss. 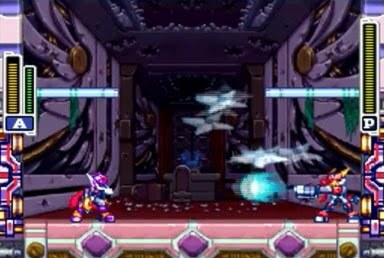 Now, 5 of these bosses are standard Mega Men, so this isn’t terribly different than changing forms in the previous iterations of the series, although the cosmetic difference is more noticeable. However, the Pseudoroids come in all different shapes and sizes, ranging from a tiny little hedgehog to a huge dinosaur-looking monster. 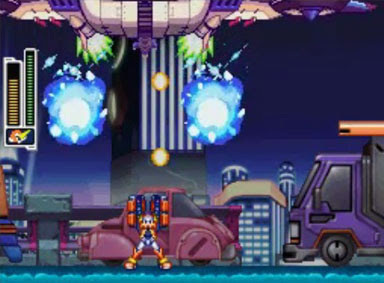 Mega Man’s movement and abilities are drastically changed when taking on these forms, often giving him phenomenal skills in one particular area, while sacrificing mobility in another. Technically, your original form is your human/Reploid self, but once you receive the Model A biometal (which occurs early into your adventure), this will become your basic default form. This is a good general-use form that allows you to get through most areas, and you’ll automatically transform back into the Model A form when speaking to NPC’s. This form is outlined in detail above. 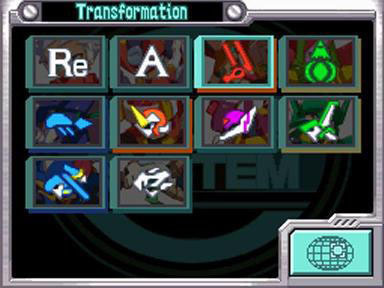 Below is a list of each new form that may be acquired, as well as its abilities; you may switch between these forms at will (when not moving) by cycling them from a menu, or by selecting them directly from the touch screen. This form is significantly taller than Model A, but its jump height is only slightly higher; however, it has a much longer horizontal jump, allowing it to cross greater distances. 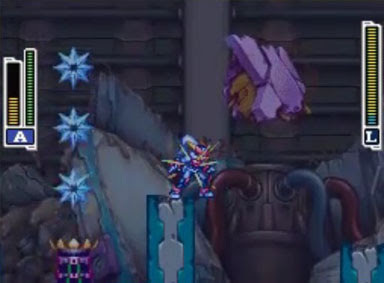 This also means that the Buckfire form moves much further away from walls when wall jumping, making it impossible to climb a vertical surface in this form. When running, the Buckfire form moves in a constant dash, but performing an actual dash allows its horns to damage enemies as a bladed weapon. Also, you cannot climb ladders in this form. This form’s standard attack is a 3-way arrow, with one shooting straight forward and the other two angling up and down. Fired arrows stick into objects and enemies and can cause continuous damage. The effect of the arrows is calculated independently, so hitting an enemy with all 3 arrows will cause 3 times the damage, but you’ll need to be pretty close to your enemy to do this. The Buckfire form’s charged attack is a pair of spinning blades that fly up at an angle to the left or right, then move downward and return. Also, by charging your weapon and pressing UP on the D-pad, you will dash straight up, traveling much higher than Model A’s standard jump height. You can also dash downward if this move is performed in the air, which allows you to break through certain types of blocks. This form is useful in the water, but it doesn’t serve much of a purpose on land. Under water, you can swim freely, whereas most other forms sink to the bottom and move slowly (although they do gain increased jump heights). You can shoot ice torpedoes in a straight line, and you can dash in any direction for a bit of added speed. 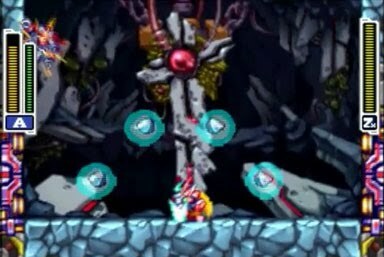 The Chronoforce form also has a hard shell on top, allowing you to press yourself against spikes above you without being killed. On land, you are completely immobile. The only thing you can do on land (which also works in the water) is perform your special attack that slows down time. This is a useful ability, particularly during some of the boss battles. You can initiate this special move and then transform into any other biometal form to take advantage of its effects. This is another form with limited mobility; you will find that it moves extremely slowly and has a rather insubstantial jump. 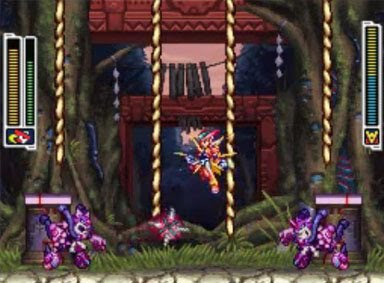 However, the form does have a unique ability that sets it apart from the others; namely, it can grab vines and climb them. When climbing, the Rospark form moves along at a good pace, and it can grab nearby vines and move to them Donkey Kong Jr.-style. Attack-wise, this form has a short melee attack, which consists of launching one of its vines straight forward. You can charge the attack to add an electrical element, which will also allow you to electrify nearby vines. While hanging on a vine, you have the ability to launch set of 4 stingers out at angles, with a charged version of this attack adding electricity as well. In your “bulb” form, you can also launch a stinger straight up, adding electricity by charging. The Queenbee form is a bit clunky, and it can only shoot a weak projectile downward at an angle, or a somewhat larger and stronger charged shot. So why would you spend any time in this form? Because it’s one of the best forms for exploring the totality of the environment, due to the fact that it essentially gives you free flight. By pressing and holding the JUMP button, you will move upward a bit. Press and hold again to move upward a bit further. Each tap takes you ever higher, allowing you to reach almost any point in the level. Wondering if there’s a hidden data disk up off the top of the screen? Fly up and find out. Just be careful to keep an eye on your BM gauge, since each tap of the JUMP button will drain a bit of the gauge, and you don’t want to run out of steam over a pit of spikes. As a secondary ability, the Queenbee can also lift certain objects, which generally allows you to clear the way to a new passage. This doesn’t differ greatly in design from the use of a key. Sadly, the name Voltron was already taken, since this form attacks with electricity (volts). The Vulturon form is very clunky when used for ground-based movement, since it lurches along slowly. 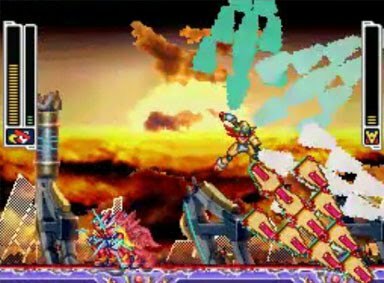 But in this form, you can jump into the air and hover back and forth like Firebrand from Demon’s Crest, which slowly drains your BM gauge. The form can also stick to walls and will not slide down them like other forms do. 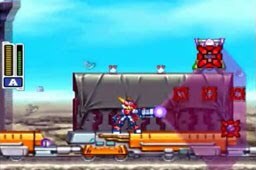 As for attacks, you can do some damage to enemies immediately around you by playing your guitar, or you can charge up to smash them with it. Like his electro-charged cousin Rospark, Vulturon is not a terribly effective attacker, but he is effective at rocking out… for what it’s worth. This small hedgehog is the smallest of your available forms, and one of the weakest. It has a standard shot that moves low to the ground and a charged shot that sends 5 energy blasts upward and outward. 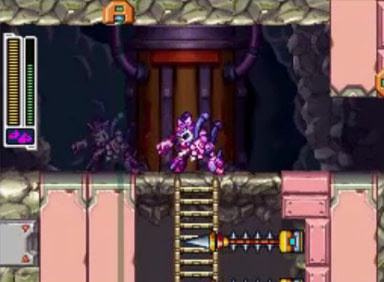 When jumping or moving underwater, these blasts move downward and outward, and you can also initiate the attack on a ladder to send shocks up and down. This form is primarily used to get through narrow passageways that are blocked by destructible objects. 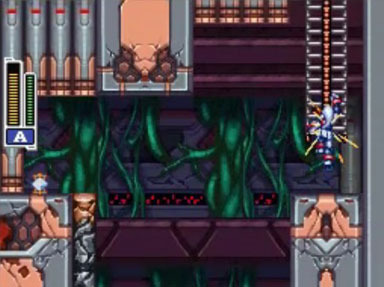 While your standard human or Reploid form can crawl through these passageways, they cannot shoot while crawling, thus making it impossible to break through blocks. 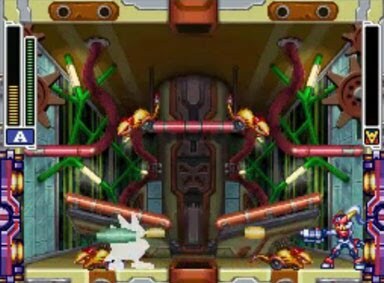 Hedgeshock, on the other hand, can roll into a spinning ball and rocket through these areas like a Morph Ball from the Metroid series. You can also become a rolling spiked ball by dashing while rolling. This form’s basic movements are limited, however, as it cannot jump very high, nor can it grab onto walls. The Argoyle form has a unique projectile which comes in the form of a bouncing shuriken. You can throw the shuriken in a straight line, and it will bounce once if it hits a solid object, exploding if it hits another object before leaving the screen. Pressing DOWN on the D-pad will send it downward at an angle, generally causing it bounce off of the ground and then fly upward. 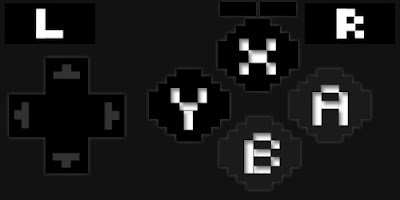 Pressing UP lets you lob the shuriken in an arc. The Argoyle form has skates attached to its feet, so you will be skating slowly around the environment. 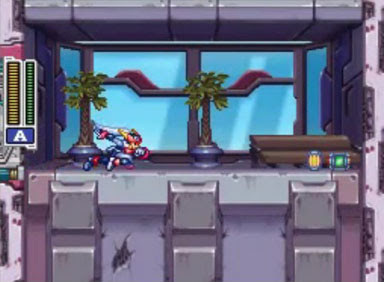 However, when dashing, Mega Man will drop down to his knees and move along at a high speed. 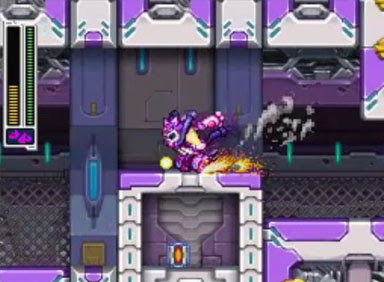 In this form, the dash never runs out, and you can shoot while dashing as well, allowing for some high speed hit-and-run attacks. The Argoyle form is earned by defeating a pair of bosses called Argoyle and Urgoyle, but you are only able to assume the Argoyle form. However, by performing a charge attack, you will summon the ghost of Urgoyle. 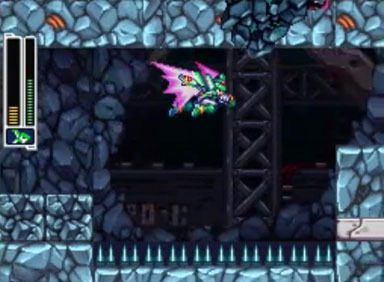 Urgoyle will hover a little ways in front of you, regardless of the direction you’re facing, even floating out over free space or appearing on the far side of a wall (which can be used to grab some otherwise inaccessible pickups). The effect lasts about 12 seconds before you have to re-summon, and Urgoyle is invincible while onscreen. Urgoyle has the ability to perform a short kick (or a spin while jumping), which isn’t terribly useful on its own. However, Argoyle can toss a shuriken to Urgoyle, who will kick it to give it an extra bounce, electrifying it and causing it to do more damage. This is by far the largest and slowest of the available forms. 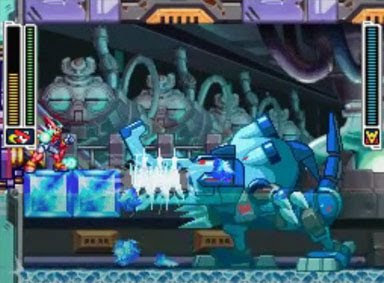 This huge bipedal ice mech marches slowly forward, shaking the ground as it walks. It cannot dash, and it is far too large to fit through any doorways. 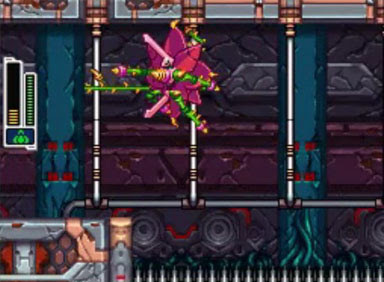 In this form, you can spit rolling saw blades along the ground (2 onscreen at a time), which climb up walls. And for a melee attack, you can take a big slow bite that causes a lot of damage, and breaks through certain electrically-charged blocks. A charged attack allows you to open your mouth and unleash a constant barrage of ice rockets (which are actually your teeth). You can keep the stream going for as long as your BM gauge holds out. This form has the ability to use its fists to punch and break through certain types of walls with a charged version of the punch. Its movement is nearly identical to that of Model A, except that it cannot shoot and run at the same time. 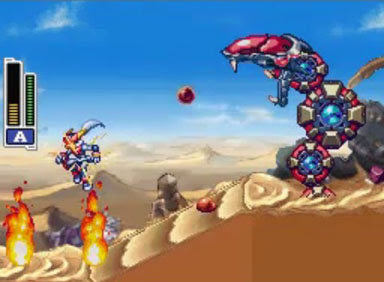 The form also possesses a number of projectile attacks. First off, this is the only biometal form that can aim upwards, and you have the option of shooting fireballs with either your left or right arm. 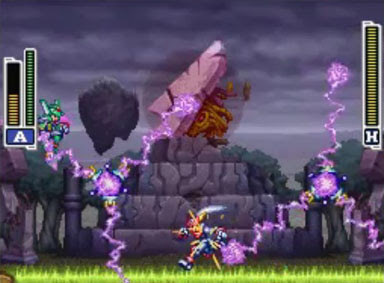 Pressing UP when the attacks is charged will send a fireball upward, and pressing down will send a fire wave along the ground for a short distance. Model F’s special ability is a programmable bullet path. 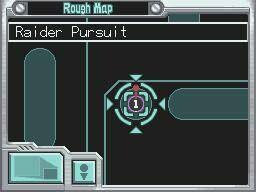 In the menu, you are able to use the touch screen to define the path of travel for your bullets. You can send them along any path you like – and define separate paths for each arm – turning the bullets in 90 degree increments. Once the assigned pattern reaches its end, the bullets will continue heading in the last trajectory you assigned. The longer your BM gauge, the longer path you can make, and this literally gives you the ability to shoot around corners. While it’s rare that you’ll be required to come up with a specific bullet pattern to solve a puzzle, it does give you a lot of versatility since you can send out both high and low attacks to deal with different types of enemies. This is a fairly fast-paced form, even though its individual attacks are not terribly powerful or accurate. Model P fires a series of daggers that start out low across the ground and rise up, which is an attack style that takes some getting used to if you plan to spend any time in this form. When jumping, this attack spreads downward at a wide angle, again making it a bit difficult to line up a direct hit. Individual daggers do not inflict much damage on your enemies. 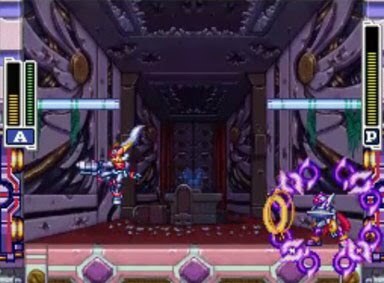 As Grey, your charged attack is a spinning blade floats out in front of you for a moment and then returns, whereas Ashe can surround herself in a ring of purple blades that harm enemies and protect her from damage. 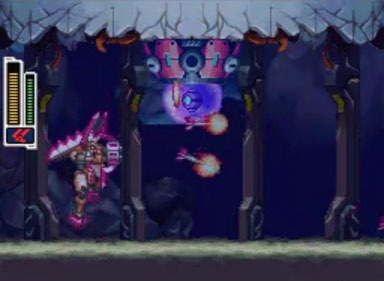 Model P’s major advantage over the other forms is its ability to hang from ledges with its claw and continue firing. It can also swing upward through thin ledges with a double-tap UP on the D-pad or swing down with a double-tap DOWN. 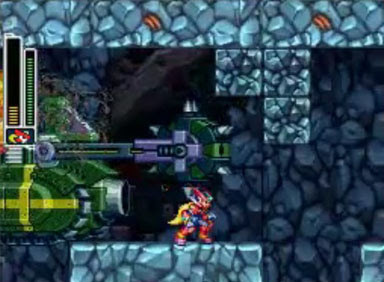 Model P’s special ability is navigation through dark environments (he is the Shadow Mega Man, after all). For any other form, entering a dark area will leave a small amount of light around the character, which isn’t nearly enough to see your surroundings. In Model P form, however, the lighted area is somewhat larger, but the character also has access to a radar screen that shows enemy placement and environmental obstacles. You can even tap the screen to fire directly at enemies from the radar screen, which consumes some of your BM gauge. This biometal form is very much at home in the water. With Model L, you can swim freely in any direction, and its movement speed is not reduced underwater as other forms are. 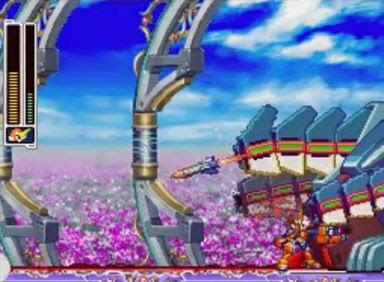 You can also dash in any direction like the Chronoforce form, except that Model L is much smaller and therefore more maneuverable (although not protected against spikes like Chronoforce). You can even swim straight up waterfalls. Model L’s primary attack is a halberd that it can swing down for a short-range attack. While swimming, this becomes a spinning attack that hits nearby enemies in multiple directions. The charged attack differs based on whether you chose Grey or Ashe as your playable character. 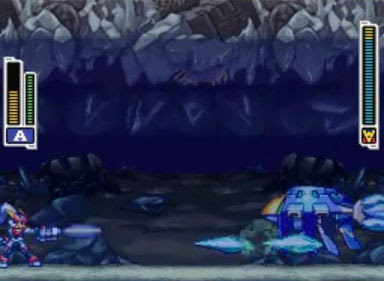 Grey can summon a huge ice serpent that travels forward, hones in on enemies, and can cause a great deal of damage. Ashe, on the other hand, can summon and cut ice with her halberd and send shards flying toward enemies. 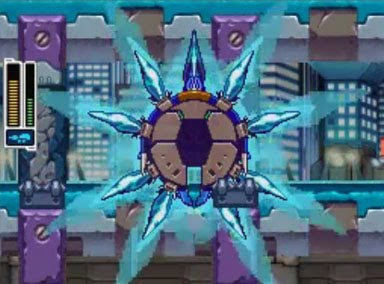 Model L’s special ability is a radar screen with a sparkling orb that seeks out items. Since the radar extends slightly beyond your actual view, this can be particularly useful when searching for hidden items that lie just offscreen. Model H is also a melee based form, with a straight swing, overhead slash, and a combo move that mixes these two and finishes with an energy wave. 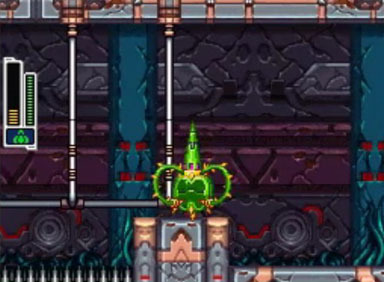 You can also charge to send a pair of tornadoes forward, with one angling downward and the other upward, and these tornadoes can pass through walls. Model H is an air-based form, and you can perform a dash in midair in any of 4 directions (only once per jump), and you can also press JUMP while you’re in the air to slow your descent. 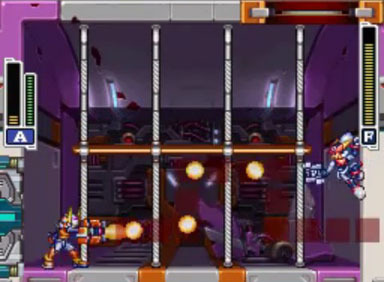 Model H’s special ability allows Mega Man to see the remaining health of his enemies, represented by silhouette of the enemy on the lower screen and a life bar beneath. This information only appears when you hit an enemy with an attack. 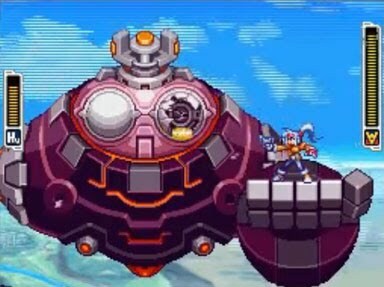 This is the Model ZX form from the original Mega Man ZX game, which combines the powers of Mega Man X and Zero. You have a standard buster as well as a charged shot, similar to Model A. Also, you have the ZX Saber, which is a bladed attack. The ZX saber has a 3-hit ground combo, a 2-hit air combo, and a charged attack. You can also perform a powerful air-based attack where you do a somersault with your saber extended, causing continuous damage to whatever you touch. Here again, this is one of the few cases where your attacks differ based on which character you choose. As Grey, you can jump in the air and aim your saber downward, which will send 2 energy balls arcing away from you when you hit the ground. As Ashe, you can perform a jumping attack with his saber that sends out an energy wave. 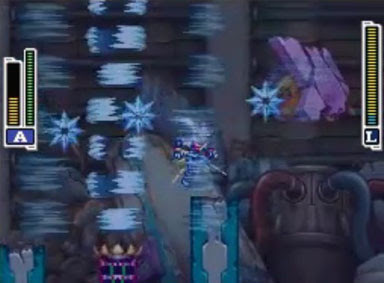 Generally, enemies that are affected by ice will become temporarily frozen when hit with an ice attack. Enemies affected by fire will burn for a bit when hit with that attack, and enemies affected by electricity will be stunned by electric shocks. 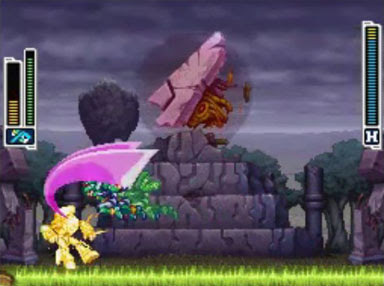 The design of most bosses and minibosses reveals their affinities, so you’ll know which attacks will be most effective. Vitaful This is an enemy that’s designed to look like a full health restorative, thus making its appearance extra bastardly. You’re running low on health, and you see a pickup just sitting there in a slightly out-of-the way place. Great, you say, I’ll just run over and grab it. But when you get close, it transforms, flies up in to the air, and then dive bombs you. So, you just lost your (illusory) health pickup, and you fell under attack… That’s a double stinger. 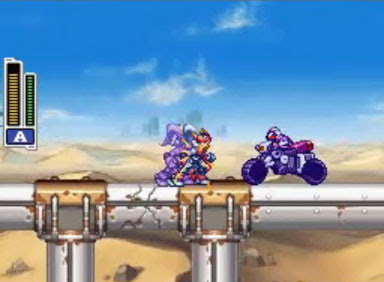 Galleon Rider The Galleon Rider is a basic infantry enemy who rides toward you on a motorcycle. 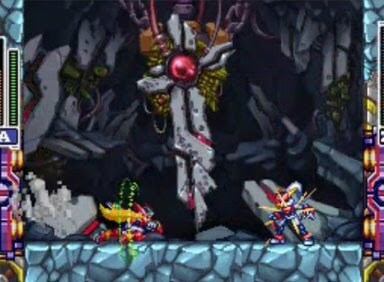 Your standard buster isn’t enough to take it down before it gets to you, even with a fully-charged blast, so you’re often left to dodge them. They pop wheelies when they get close to you, making them a bit more difficult to dodge. Plus, if you get hit by one, you’ll get pushed back, causing you to scroll back out of their spawning area. So, when you walk forward, another Galleon Rider will come at you. If you shoot the Galleon Rider with a flame attack, it will catch fire and keep coming toward you. At least if you manage to dodge it, it will wipe out and crash behind you, filling you with the same glee that you get when watching someone get hurt while doing something really stupid. As mentioned, Mega Man ZX is chock full of boss encounters. Because of its nonlinearity, sheer number of bosses, and varying types of bosses, we have divided them into separate sections for ease of reading. There are 11 miniboss encounters, each of which requires different strategies to defeat and some are even weak against certain elements, but none give Mega Man any additional powers or allow him to change forms. 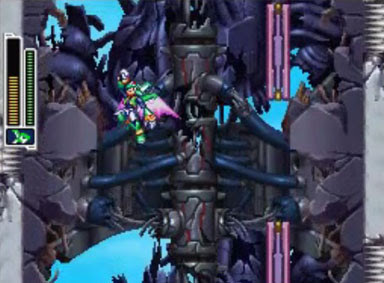 Generally, each set of levels contains one miniboss encounter as well as a full-blown end-boss. 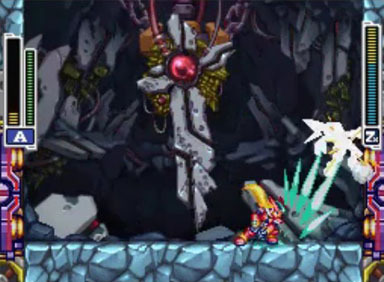 Minibosses also reappear when you return to the area, so you may need to fight them more than once if you are exploring a previously-completed level. For a first boss, this one is pretty big, but really you’re just dealing with its two hands and its head. You can jump on its hands and ride them as they move around, and you’ll need the extra height to shoot it in the eyes, which are its weak point. Dogu will open its eyes, and shoot lasers from each eye to the left and right, and the lasers sweep downward, leaving the only safe point directly below him. Then, Dogu will open its mouth and start dropping bombs straight downward, forcing you to move out of your previous safe spot. Dogu can also slam one fist down onto the other to crush you. 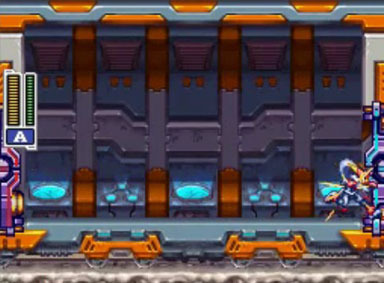 When playing as Grey, there is a platform running across the length of the floor. A spinning pyro-bot hangs out around the bottom of the screen, occasionally sweeping by with spinning jets of fire that emerge from the holes around its base. It’s a bit difficult to dodge since the spinning attack moves between the background and foreground. When fighting this boss with Ashe, the encounter is a bit different, and you’ll be fighting him over a bottomless pit and standing on the pyro-bot as a platform. A dome-shaped object drops down from the ceiling with 2 wavy robot arms on either side. If you touch the arms, you get stuck, which leaves you open to its follow-up attacks. Langbranch will start firing homing missiles at you, but you can shoot them down. Eventually, 3 hovering satellites will emerge from the dome, sit still for a moment, and then turn red and explode. These can be shot and destroyed as well. The dome alternates between emerging from the ceiling and the floor. 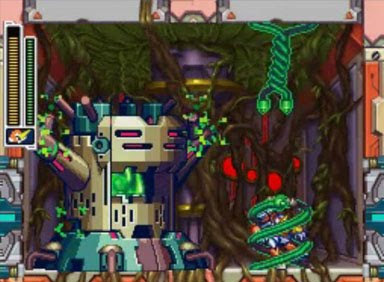 As the battle goes on, it will eventually be able to summon up to 4 arms at a time, with 2 appearing next to it and 2 on the opposite side of the room. If you cause enough damage to the arms, they’ll retract, and the dome will open, revealing its core. Turn up the heat until the dome closes, and repeat until golden brown. Spidrill gets its name because each of its legs (there are only 4) is equipped with a drill. The spider is vulnerable in a number of areas, including its head, body, and the colored joints in its legs. The spider moves up and down, and can put its front legs together to send electricity spouting up in arcs like a roman candle. It can also drop 4 small spiders down onto the ground, which walk around, and eventually turn red and explode. But by far its most interesting attack is the one that has to do with the layout of the room. Every now and again, the spider will extend its legs and spin them around clockwise. They’re a bit difficult to jump over – and you can’t wall jump due to spikes on the sides of the room – but if you time it right, you can get in some good shots on the joints in its legs. Each joint is assigned a color and there are 4 blocks in the floor that correspond to these colors. Whichever color joint you damage most determines the spider’s follow-up attack, whereupon it will drill through the block of the matching color. This gives you the opportunity to determine which leg will attack and where it will go, which is important since it can cause melee damage as it moves across the screen to drill the block. You can fall down through the hole that the spider created and you’ll find another set of colored blocks on the next level down, which operate in the same way. But the lowest level is lined with electrical tubes that will hurt you if you touch them, so you’ll either need to be smart about which blocks you let the spider drill, or be fast about killing it. This is a fire-based metal serpent that rises up from the top of a sand dune, while a river of sand flows down the slope, acting like a conveyor that pushes you back. It can fire a trio of sticky balls into the air, which can either hit you directly, or land on the conveyor and move downward. Touching one of these balls will reduce your speed and jump height. Since the boss’ weak point is its head – and it’s at the top of a hill – you’ll need all the mobility you can get. The gems in its body will light up when it’s ready to unleash a fire attack, which takes the form of a fire ring made up of 4 segments. The ring moves across the screen, stops, and then breaks into its 4 separate parts and expands slowly outward while spinning, making it difficult to avoid. 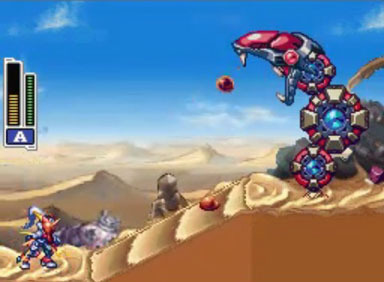 Alternately, the snake can lower itself partially down into the sand and send a fire ring rolling straight along the ground and off the screen. For a melee attack, it will simply fall over, laying itself out across the length of the conveyor. It remains stationary for quite a while after this attack, allowing you to get in a few extra hits. 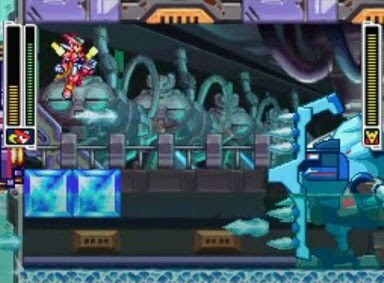 Occasionally, the screen will turn blue for a moment and the boss will open its mouth and let out a scream, which stuns Mega Man and leaves him unable to move. It’s avoidable if you’re not too close, but you don’t have much time to react. If you are stunned, you’re going to want to start working the D-pad around to break free of your temporary paralysis and avoid leaving yourself open to another attack. 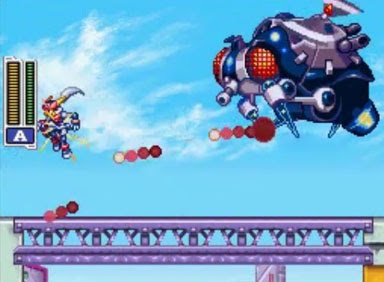 The King Flyer is reminiscent of the insect creature you fought in the introductory level of Mega Man X.. It hovers in the air with helicopter blades, summoning 3 smaller fliers that circle around each other and come at you along the ground, but they can be shot down. It occasionally rubs its legs together and sends out a series of red projectiles, first aiming toward the ground, but slowly rising to an upward angle. These can be difficult to avoid if you’re standing in front of the boss, but there’s nothing stopping you from running around behind it and avoiding the attack altogether. It’s also a great spot to get in a number of free hits. 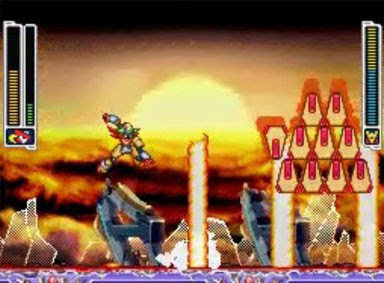 When destroyed, falls and crushes the floor – again, like the creature in Mega Man X – causing you to fall down into the area below. Of course, you can simply wall-climb your way back out and resume your journey, but it’s a nice throwback. 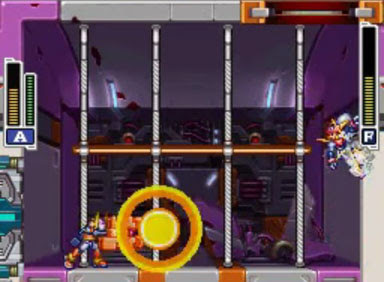 The Capsule Converter boss layout is similar to that of the Energizers boss in Metal Storm, except that these are not restricted to firing in a straight line. 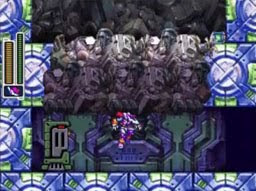 There are 5 converters on the wall and a set of 3 platforms in the center that you can jump on to avoid their shots. 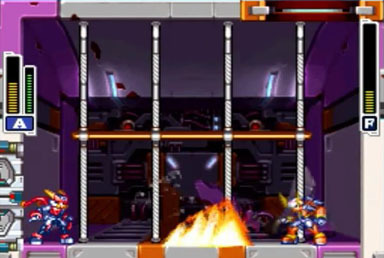 They fire one at a time, firing in either a straight line, or in an orthogonal path, similar to the programmable projectiles of Mega Man Model F. Before firing orthogonally, you’ll see the path that the projectiles will take, giving you a chance to avoid them and to get to a better firing position. Concentrate your firepower on one or two converters to reduce the number of projectiles you’ll have to contend with. This ship comes in from the background and hovers above you, firing slow-moving blue clouds toward you. If you shoot the cloud, it breaks into 2 smaller clouds, which can be destroyed with a second shot. The Cankerfly will continue flying away and returning until you cause enough damage, and then it will fly further down the road. In its second and third phases, it will continue launching the clouds, and it will also drop bouncing bombs which can hit you directly, or hit cars sitting on the road. These bombs can also be shot down. 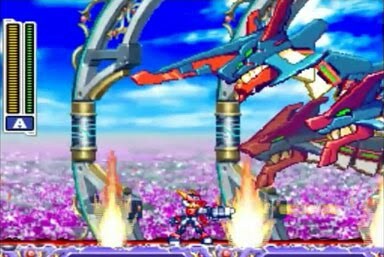 Since the boss sits above you, your Flame Mega Man form (Model F) is very effective against it, given that it can shoot straight upwards. 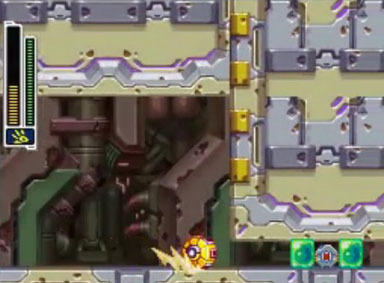 Since the bombs emerge from the doors on the bottom of the ship, firing up into them will not only damage the boss, but also destroy the bombs before they can reach the ground. 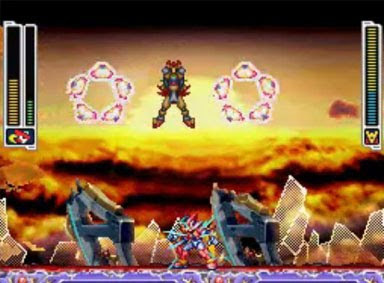 There is a second miniboss on the Highway level, consisting of a core with 4 satellites, 2 of which are blue, and 2 are red. These satellites rotate counterclockwise, and the core continuously opens and closes, exposing it to attack. 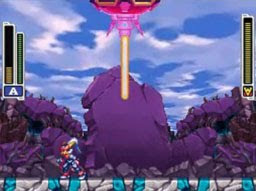 However, the satellites deflect your shots, making it difficult to shoot the core. Periodically, the core will stop moving and send the satellites straight away from itself. Avoid the satellites, get up close to the core, and unload. 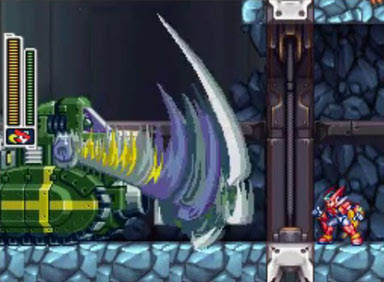 The boss can also impact the environment, as it moves to the left and grinds up the ground, opening up pits. These pits have water at the bottom, but bottomless pits lay beneath that, so you have to be extra careful not to fall all the way down through the water. 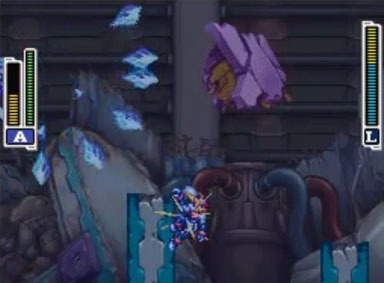 Also, since there are portions of this fight where the screen is scrolling, you need to be careful not to get stuck between a wall and the edge of the screen, because that leads to instant death as well. Since the boss drops in behind you, it can work as a chase where you try to run ahead of it and escape before it reaches you, but you’ll be slowed by a number of blocks that you have to destroy on your own (with Model F’s charged fists). However, there is also BM upgrade and a data disk that you’ll miss if you simply run through as quickly as possible. So you may decide to try and fight it. 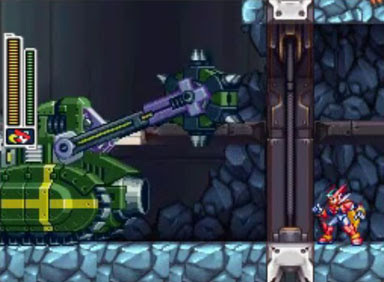 In this case, you need to balance shooting and running, since you’ll need to break blocks in front of you to clear a movement path while shooting behind you to hit the Crushpactor. 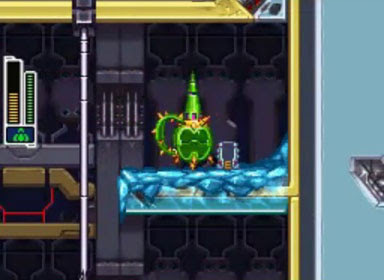 The spiked roller blocks your shots, however, meaning that you’ll need to time your shots to shoot beneath it. Or you can get in behind it, either by jumping over it or letting it hit you and running to the left during your temporary invincibility period. This lets you get in as many free shots as you like, but you’re still going to want to destroy the thing before it crushes the BM upgrade and data disk. If you have your wits about you, you may recall that the Chronoforce form will allow you to slow time, giving you a few extra seconds with which to whittle the Chrushpactor’s health down, which can help you greatly with any of the above strategies. If left to its own devices, whether chasing you or being chased, the Crurshpactor will eventually destroy itself by driving into a pit of spikes at the end of the section. The encounter against Spidrill Neo is nearly identical to that of Spidrill. It has all of the same attacks as it did the first time you faced it, with the addition of an electricity attack that sends charges up in an arc. 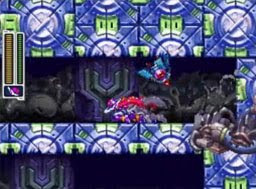 However, it can no longer destroy the blocks in the floor, which makes the battle far less interesting. A bole is essentially a tree trunk, and in this case, it’s like a mechanical tree trunk. A crystal drops down into the machine and activates it, and it starts chomping with its “mouth”. It can shoot green energy spikes from its mouth one at a time, aiming first at the floor and then rising upward. These projectiles stick in the floor or wall for a few seconds before disappearing. The Bole will occasionally fire a clump of electrically-charged leaves up off the top of the screen, which slowly fall back down to the ground, swaying back and forth as they go. It can also reach vines down into the ground, which will rise up where you’re standing and grab you (unless you manage to dodge the attack). While it’s holding you, it will fire off a ball of electricity that bounces around between its vines and shocks you. The Bole’s weak point is its mouth, which opens each time it attacks, with the exception of its leaf launch attack. 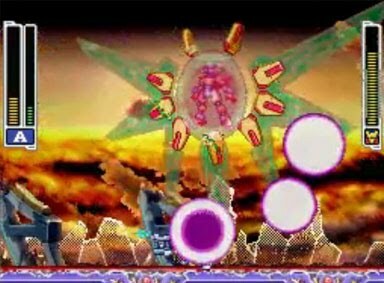 Unlike minibosses, Pseudoroids remain destroyed once they have been defeated. However, you have the option to re-fight these battles to earn medals by defeating them in a certain way. Various NPC’s will give you hints about what methods you need to use to earn the medals. Speaking to the NPC will also resurrect the boss back in its original location. 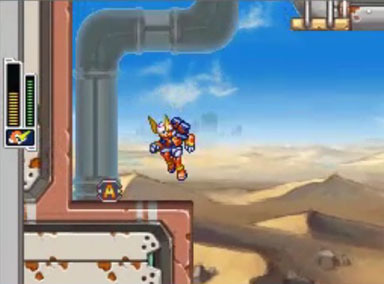 The medal system is a remnant from Mega Man ZX, but it has been marginalized somewhat in Mega Man ZX Advent. 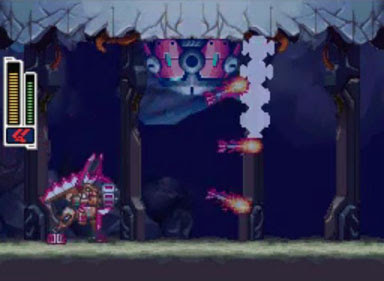 In the first ZX game, hitting a boss in its weak point caused additional damage, but also damaged the biometal, which had to be repaired before it was at full strength. In ZX Advent, however, medals are just there to provide an additional – and entirely optional – challenge. Usually these medals are earned by using a certain type of weapon or form against the boss to defeat it. Of course, all defeated Pseudoroids reward you with the ability to transform into their shapes, retaining most of their abilities. 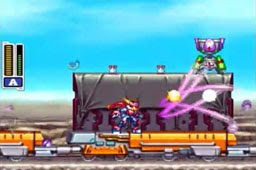 This battle takes place within a train car, and Buckfire destroys bits of the roof as he uses his air-based dash attacks. 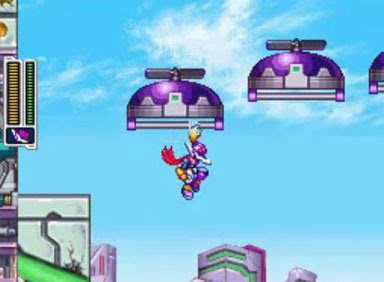 He can dash along the ground to hit you quickly, perform a vertical dash to fly up into the air, or perform a dash from midair to slam back down to the ground at an angle. Buckfire’s main weapon is a trio of flaming arrows, with one flying straight forward and the others angling upward and downward. The fire remains lit for a few seconds after the arrow makes contact, and you can take damage from an arrow stuck in the ground or a wall. After a while, Buckfire will begin using a secondary attack to send a pair of blades up at an angle. These move away from him, angle back down, and then return, making for a somewhat difficult attack to dodge. This is an underwater battle, so your basic movement will be slow, but you can jump the full height of the screen. 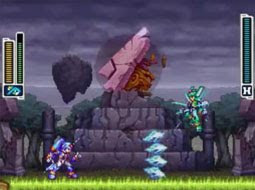 Chronoforce, on the other hand, is free to move to any point in the environment, as well as move offscreen. 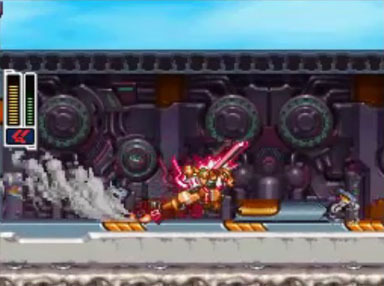 The boss can dash across the screen in a straight line, leaving behind a current that pulls you toward it. 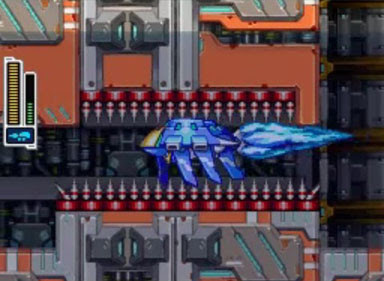 It can dive into the ground and emit 4 small ships that move toward your position, as the boss itself moves along the ground. It can rise up and fire 2 slow-moving ice torpedoes across the screen, which it follows up by moving across the screen at an angle. 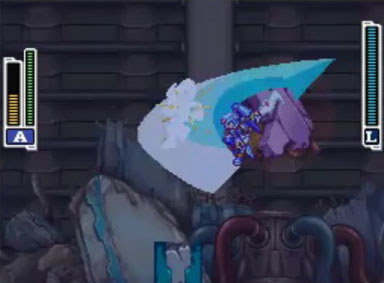 It can also rise up and fire 4 ice shards in an angle, which will freeze you if hit, after which the boss will charge across the screen, potentially hitting you while you are unable to move. If you avoid being frozen, you can get in some quick hits as it passes you. 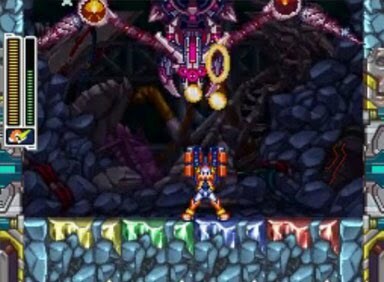 Finally, Chronoforce’s special move is the ability to slow down time, which retains your movement speed but allows the boss to move more quickly. Chronoforce can also move into the background and launch ice shards all around the room, which are a bit difficult to dodge due to their number and speed. Then, it will reverse time and cause the shards to move back in the opposite direction. 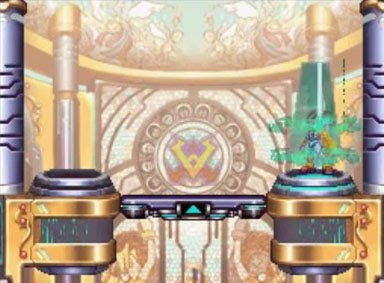 There are 4 vines in this room, and Rospark is free to move between them and climb up and down. The boss will use this position to its advantage as it moves around the room firing volleys of 5 energy bolts to the left or right at angles. It can also send out bolts that stick to the walls and electrify them, creating a field between them that hurts you. 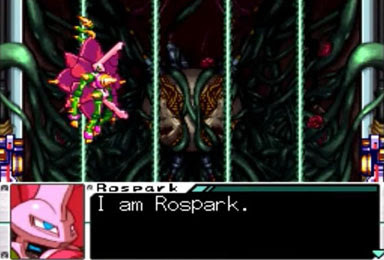 Rospark has a short melee attack, where it lashes a vine out toward you, and it also has an electrified version of this attack. 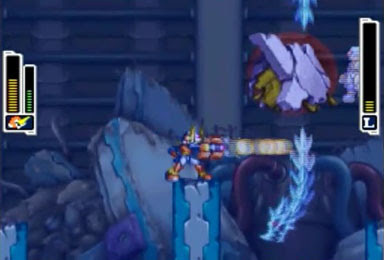 It has a huge energy blast that it fires straight across, and then it moves up or down to drag the blast along to hit you. 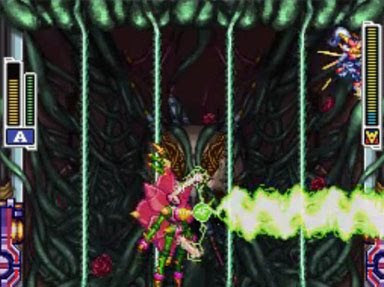 This insect-based boss consists of a large metallic hive being carried around the room by a winged mech. Ports open up on the hive periodically, unleashing various sorts of attacks. For one, the hive can launch rockets with medium tracking, and these can be shot down. Ports can open to send out rays of light that cause damage if you are caught in their path. Small bees can emerge from the ports periodically and fly toward you, but these can be shot down as well. Once you cause enough damage to the hive, it will break apart and disappear, leaving Queenbee’s real body exposed. She will fly around and shoot downward at an angle. You can unload on her during this time, but eventually she will fly off the screen and return with a replacement hive. 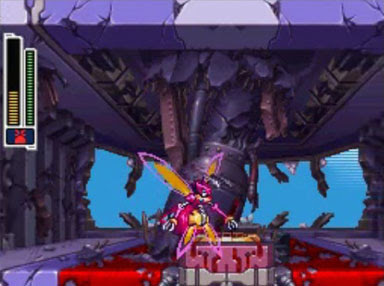 Cause even more damage and the Queenbee will rise up and start firing lasers straight down, creating a dome of fire with fireballs that leap out to the left and right, covering the bulk of the playfield. This is a head-banging skeletal bird that can fly though the skies playing its guitar. It can shield itself with sound waves as it moves across the room. It can hover and send trios of sound waves down to the ground, which in turn cause bits of scrap to rise up and move toward you. These rock ‘n’ roll-generated mechs are called “Funky Junk” and they can be destroyed by your weapons. The boss can also stun you with a shockwave from across the room, which will keep you from being able to shoot for a few seconds. There are several chains mounted to the ceiling. Cause enough damage to Vulturon and he’ll drop them down into the room. 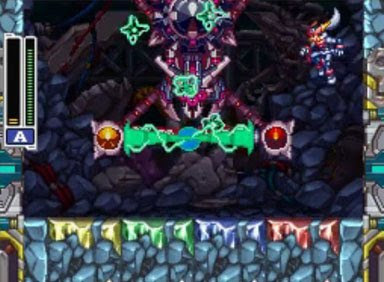 The chains block your shots until you shoot the spiked ends and destroy them, but they regenerate after a few seconds. He can also summon a shield which protects him from attacks, and hurts you if you touch it. And Vulturon can rock your heart out with a guitar smash to the face. As the name implies, Hedgeshock is an electric hedgehog; however, he also has an odd affinity for water. 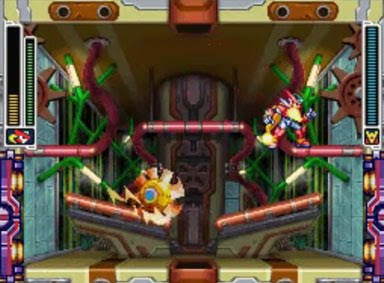 The room has several platforms, with some of them aligned at an angle to help Hedgeshock make better use of his rolling attacks. 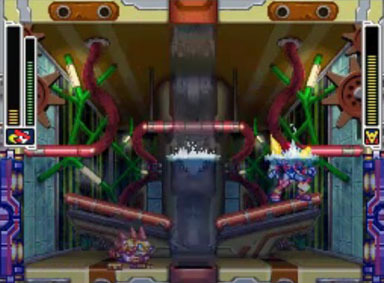 In the upper corners are wheels that Hedgeshock can spin, causing water to enter the room and rise up. He can summon 4 rats that crawl around on the platforms. The rats are very short (as is Hedgeshock), meaning that most of your projectiles will fly over their heads, so it’s better to break out a bladed weapon and institute a half-price vermin sale. Shisa are traditional Japanese male and female guardian dogs, typically represented as gargoyle-like statues with the male guardian dog’s mouth closed and the female’s open, which is why Argoyle is the speaker of the pair. 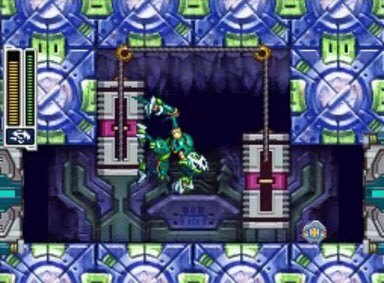 The bosses attack you in tandem, jumping back and forth between the platforms on either side of the room, and they can dash along the ground in opposite directions. Sometimes they will toss a shuriken-looking spiked object at you, which can hit you directly or take a low bounce off the ground and then hit you. They can also kick the shuriken back and forth between them, eventually causing it to burst into 3 energy balls. 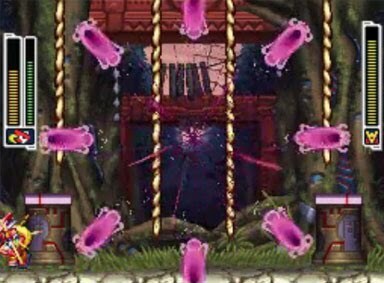 Sometimes they will jump up and hang from ropes and start kicking the shuriken back and forth as they slide down, and it eventually explodes into a purple energy ball that emits projectiles outward in a circle. The bosses have a shared life bar, but it’s 50% longer than any of the other bosses. You can destroy one of the two bosses before the other, at which point it will turn gray and stop working. 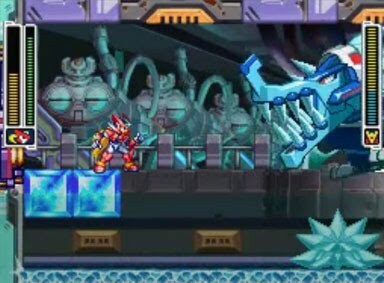 This is by far the largest Pseudoroid boss in the game, and this huge bipedal ice crocodile is more like an ice dinosaur. It can open its mouth and devour the ice platforms on either side of the room, removing your safe attack area unless you can hold him back. Bifrost launches rolling saw blades along the ground, one or two at a time, and he can summon a spiked ice pile on the ground, which he them jumps on, sending shards outward. Once he takes enough damage, Bifrost breaks out the big guns, or at least the big rockets. He uses his flip-top head to open his mouth to 180 degrees and start launching his teeth at you like rockets. He has 3 teeth along the top row and 3 along the bottom, and they regenerate after they’re fired. The more damage he takes, the more erratic the firing patterns become. 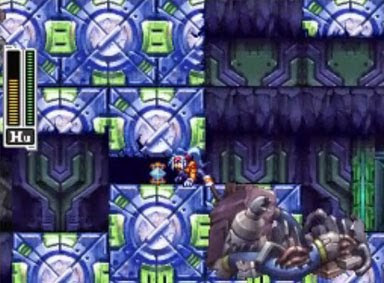 Mega Man bosses are just like you. They are people/Reploids who came in contact with a biometal and MegaMerged to gain new abilities. As you defeat these Mega Men, they are not destroyed; rather you copy their data so that you can MegaMerge into the same forms. 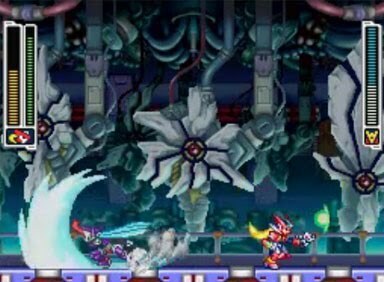 When going up against the various Mega Man forms, the fights will differ a bit depending on whether you are using Grey or Ashe. 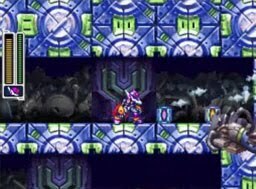 Each Mega Man boss has a unique attack depending on which character he is facing. Also of note is that all of the Mega Men are named for the moons of Saturn, and they are all based on Mega Man models from previous games in the ZX and/or Zero series, as noted below. According to the instruction manual, Atlas is female, although she certainly sounds very masculine. She can shoot fireballs in a straight line, or along an orthogonal path like the Capsule Converter (above). In this firing mode, the path of her projectiles is shown to you briefly before she fires, allowing you to find a position to avoid the projectiles, hopefully while unleashing some damage on her at the same time. 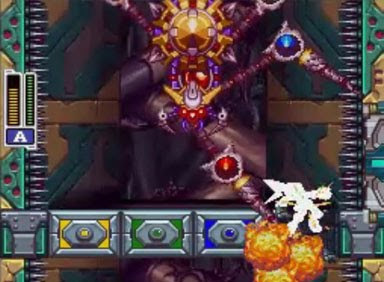 She has a few charged shots, including a large yellow fireball that flies all the way across the screen, exploding outward when it hits a wall. You can stand directly below this explosion or cling to the wall above it to avoid taking damage. She can also fire upward with both hands, in rapid fire. When fighting as Ashe, Atlas will lay a row of bombs along the floor, which explode after a few seconds. 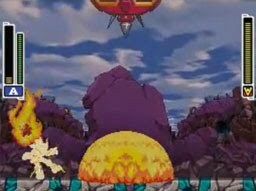 When fighting her as Grey, Atlas can unleash a huge ground-based fire blast, but this attack has a fairly short range. The instruction manual lists this character as Sirnaq, but he is called Siarnaq in-game. Siarnaq has a fast attack where he sends 4 daggers out in a spread or 2 daggers straight across the screen. When fighting him as Grey, Siarnaq can send out a pair of spinning blades that bounce around the room and absorb your fire. When fighting as Ashe, he surrounds himself with spinning purple blades that he can send spiraling outward. 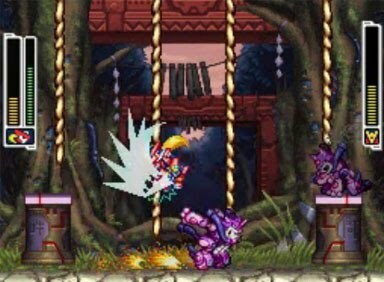 Siarnaq’s special moves include the ability to hang from a ceiling or platform (while still able to shoot daggers at you), and he can disappear and reappear anywhere in the room. After taking enough damage, he can split into 3 forms and hover in the air and throws daggers. Per genre conventions, only one of the forms is real. If you hit the real one, the boss will take damage and the fake ones will disappear. Hitting fake a one causes it to disappear. 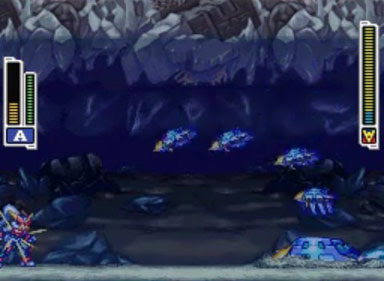 This is another underwater battle against an ice-based boss, but this battle takes place on a handful of narrow platforms surrounded by bottomless pits. Thetis can move freely in the water, fire ice daggers at you, and drop down to spin his halberd into your face. When fighting as Grey, Thetis will send out huge ice serpents that swim in a wave formation toward you. As Ashe, Thetis will summon a hunk of ice and cut it with his halberd, sending the shards outward in a semi-circle. 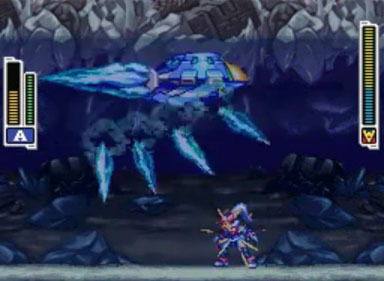 Once Thetis takes enough damage, a snake-like thing rises up between the platforms and fires ice blades up off the top of the screen, which float slowly back down to hit you. 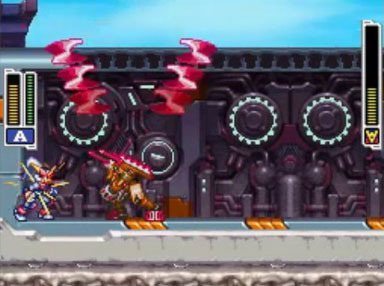 These blades are destroyable, and they’re primarily in place to knock you back off the safety of your platform. The snake also has a whirlpool attack that pulls you toward it, potentially dragging you off of your platform and into a bottomless pit for a nice insta-kill. Aeolus tosses tornadoes at you that cause damage, which is a change from the tornadoes in the preceding levels that simply lifted you up. When fighting as Ashe, Aeolus can send whirlwinds at you horizontally, whereas he will send a pair of whirlwinds out at an angle when facing Grey. 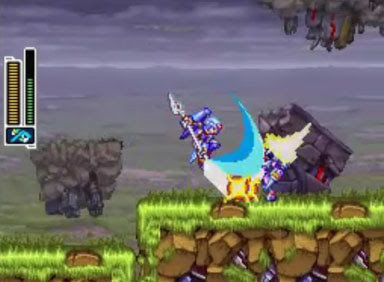 Aeolus can jump and rocket straight across the screen or perform a single downward sword slash. 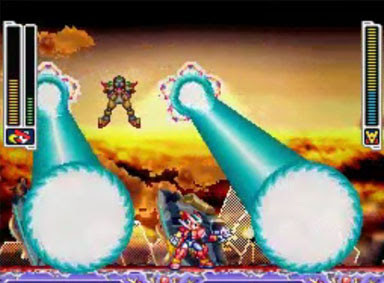 While on the ground, he can perform multiple sword slashes, with the finisher being an energy wave that moves in a straight line low to the ground. Once he takes enough damage, Aeolus hovers and summons a pair of orbs that spin and emit electricity, and these are difficult to dodge. 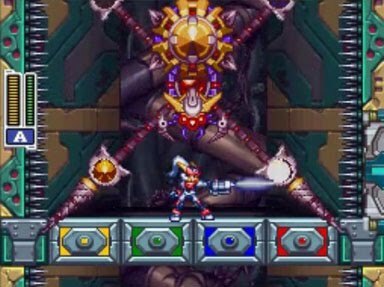 In the first Mega Man ZX game, you were able to select either a male or a female character. 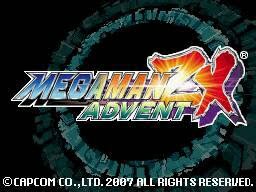 In Mega Man ZX Advent, you do the same. The character that you selected at the beginning of Advent will determine which of the original ZX characters you meet here. 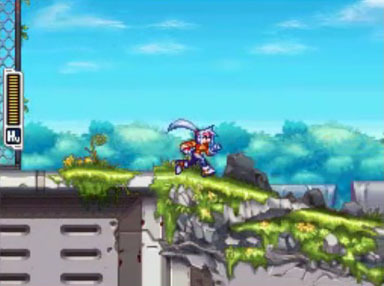 If you chose the male character (Grey), then you will meet Aile, the female protagonist from the first Mega Man ZX game. 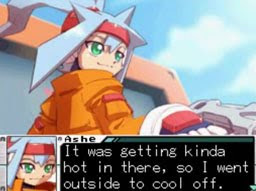 If you chose the female character (Ashe), then you will instead meet Vent, the male protagonist from the first Mega Man ZX game. In any case, both Vent and Aile are able to MegaMerge into the Model ZX. 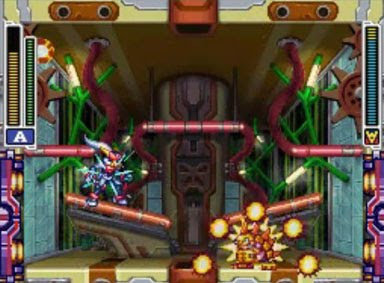 Model ZX has the same basic abilities as it did in the original game, including regular blaster shots, charged blaster shots, and super-charged blaster shots, as well as the basic running, jumping, and wall-sliding moves. 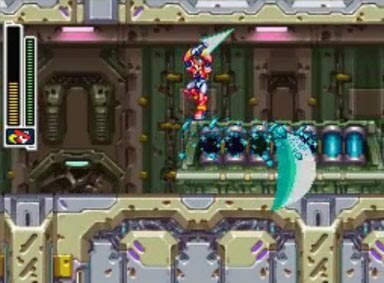 ZX is of course equipped with the Z-saber, which allows it to get up close for melee damage. 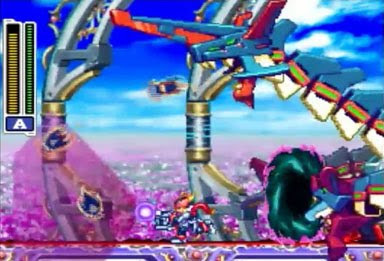 When fighting against Grey, Aile can jump into the air and plunge her Z-saber into the ground. When fighting against Ashe, Vent can perform a jumping attack with his saber that sends an energy wave toward you. 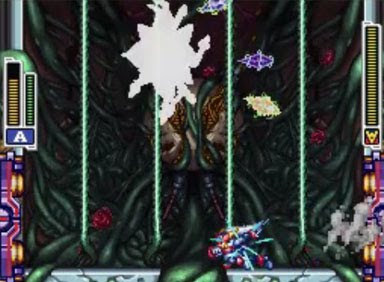 At the beginning of this boss encounter, you are led to believe that you will finally be fighting Albert, the big bad of the story, and the final boss. However, it turns out that Prometheus and Pandora have a beef with him as well, and decide to kill him on their own. However, Albert was just a decoy, and after it is destroyed, Prometheus and Pandora turn their attentions to you. 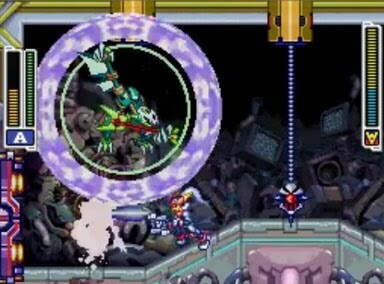 Prometheus and Pandora were Serpent’s henchmen from the first Mega Man ZX game, and while they regularly hound Mega Man throughout his adventure, this is the only time that you actually engage them in a fight. 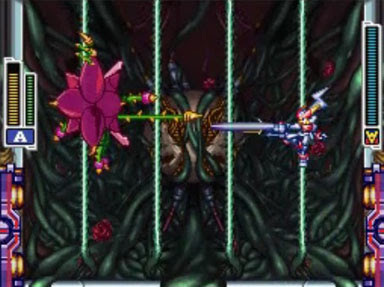 This is a very complex boss battle, as you are facing two skilled fighters at once, each of whom has a pair of affinities. Prometheus is aligned with both fire and shadow, where Pandora is aligned with ice and electricity. 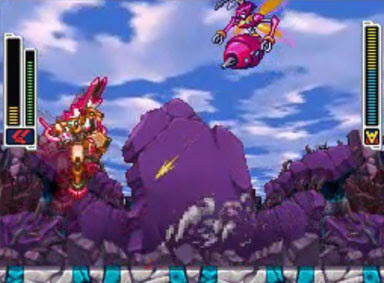 The bosses can take you on individually and perform tandem attacks, and they share a life bar. Pandora surrounds herself with 4 floating electrical spears that revolve around her body and shield her from damage. Occasionally, she will launch 2 of the energy bars off the side of the screen, which will return to her. These can either move off the screen high and return low, or vice versa. With fewer spears around her, she is open to direct attack as the rotation exposes her body. Prometheus sends out braids of fire to the left or right, or they can revolve between the background and foreground, spinning around him. You can run safely across while the flames are in the background, but must avoid them in the foreground. In tandem, Pandora will move back and forth across the screen and descend while Prometheus dashes along the floor and swings his sword. In another tandem attack, Prometheus will stand on the floor and summon rows of swords up from the ground that travel to the left and right, while Pandora summons critters to fly toward you. And in a third tandem attack, Pandora will appear and summon ice spears while Prometheus drops down from the ceiling to dive bomb you with a fire attack, hitting the ground and launching 3 balls of fire outward. Once defeated, the energy created from the pair’s bad vibes is sucked into Model W forms, awakening them; and the real Albert appears. 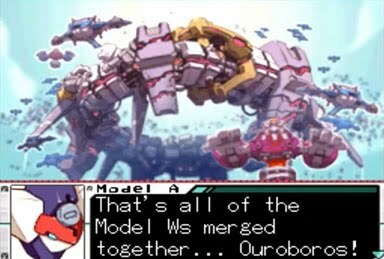 The Model W forms merge to create Ouroboros, a huge airship, which flies off with Albert and sends out Mavericks to destroy everything. 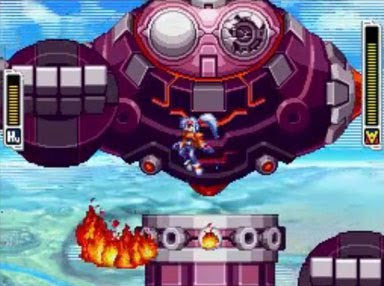 Vent/Aile has his/her own airship, and uses it to board Ouroboros, leading you to the series staple onslaught of 8 boss fights in a row. 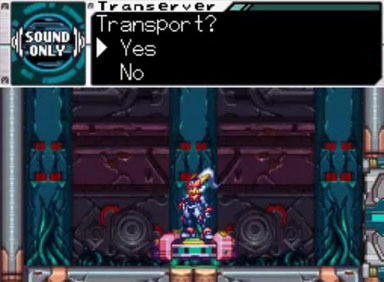 You’ll enter a room with 4 transporters, each leading to one of the Pseudoroid bosses. Defeat them all and head to the next room with another 4 transporters. 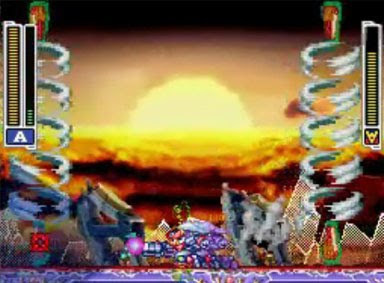 Then it’s off to a spike-laden level before you face the final boss. There are no save points during any of this, so using up all of your lives will mean that you’ll have to face all 8 bosses and the spike level again on your return trip to the final boss. Buck up! 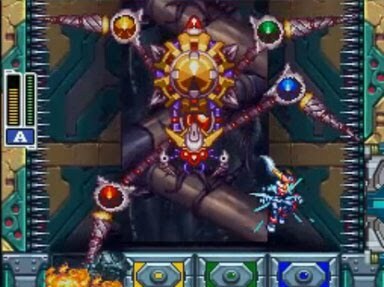 After defeating all 8 Pseudoroids (again), you’ll encounter each of the 4 primary Mega Men again, Aeolus, Thetis, Atlas, and Siarnaq. Fortunately, you do not have to fight them. 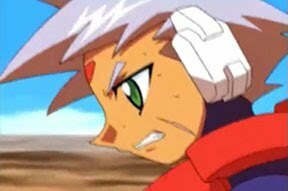 Vent/Aile enters and holds them off while you continue onward to face Albert. 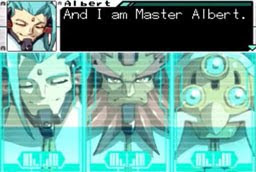 Albert takes the form of a 3-headed biometal dragon, which has a wide range of attack types. 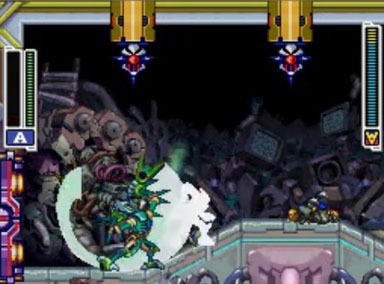 The heads can attack on their own or combine to perform tandem attacks. Albert’s weak point is his body, so much of the battle is a matter of balancing the need to dodge incoming attacks while running in close to land hits on his body. 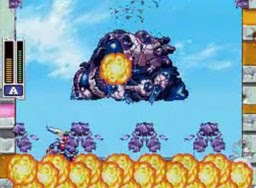 In the first phase, the rear head moves into the background and faces the screen, sending out projectiles which hit the floor and explode into flame spouts, and the foreground head can send a ball of dark electricity along the ground. 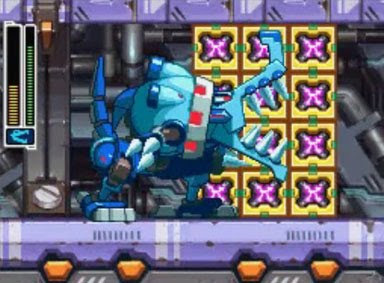 In another attack, the center head extends all the way across the arena and paces its metal horn-like protrusion against the ground and starts dragging it along the floor. This gives you an opportunity to get in close to its body to do some damage, and you can shoot the horn to knock it away from the floor for a moment, allowing you to pass safely without taking damage. 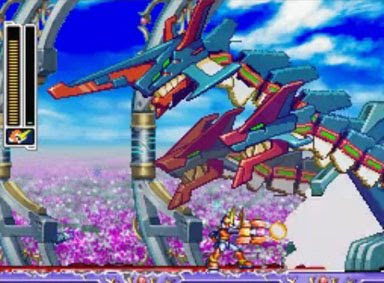 In its tandem attack, the front and rear heads turn toward each other and summon a black hole which pulls you toward it, while the center head fires off a series of black projectiles that are pulled into the black hole. 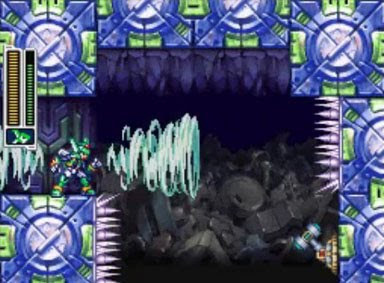 When the projectiles enter the black hole, they re-emerge from a white hole on the opposite corner of the screen coming out one at a time, firing downward at first and then angling upward. After causing enough damage, the battle enters its second phase. 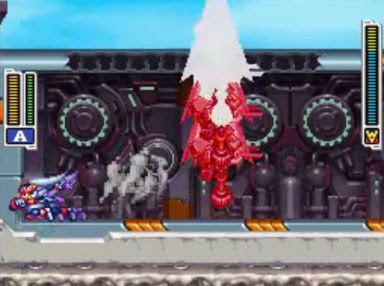 Here, the dragon can launch each of its 3 heads off of its body which will return to the screen to fire projectiles at you from different angles, after which the flailing neck pieces will fire rockets at you. This cycle continues, with the heads continually moving onto the screen, firing, and moving away, with neck-missiles between each of these attacks. 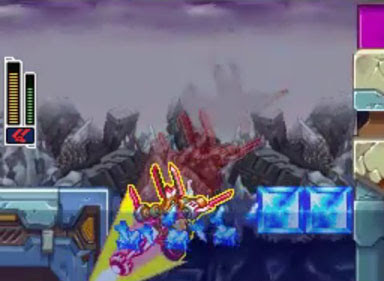 Once you have caused enough damage, the heads will fall out of the sky and the rest of the body will explode, revealing Albert in his true form and the final phase of the battle. 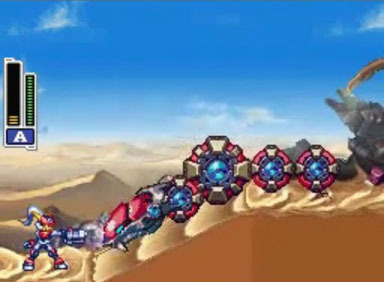 Albert has a wide range of attacks, and he is surrounded by a ring of metal pieces that block your attacks. 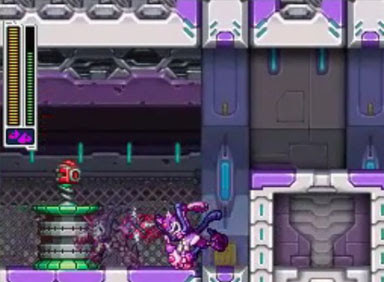 In order to make Albert vulnerable, you will need to destroy each of these metal pieces. However, these pieces can also fire off fast-moving purple lasers - telegraphed by a red floating target - which explode when they reach the target point. Albert can drop 4 tornado generators, 2 at the top of the screen and 2 at the bottom. These send spirals of air between them vertically, pulling you toward them while the lower generators fire wind blasts at low angles across the ground, which rise up as they move across the screen. 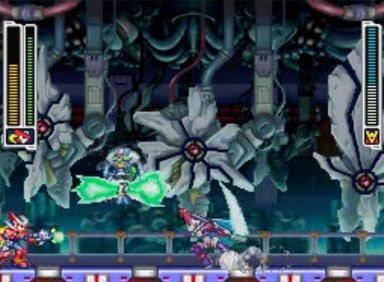 The generators can be destroyed, however, which will prevent them from attacking, but they’ll also disappear on their own after a few seconds. Albert can launch pieces of his shield off the top of the screen. These shield pieces re-emerge in pairs, bound together by energy to create huge spinning blades that move horizontally across the screen. And, he can emit an energy blade beneath him and jam it into the ground, dragging it along toward you, but you can avoid this attack by simply running to the far corner of the area. Once Albert’s protective ring is destroyed, his shield will drop and he will fall to the ground, allowing you to get in some quick attacks. At this point, he’ll begin to unleash a new series of attacks using the pieces from his shield ring to create various shapes. One is shaped a bit like a fist, which slams down into the ground and sends up pillars of fire. Another is a huge sword that he swings over his head. He can smash his own fist into the ground and summon a serpent like construction made from pieces of ice and the shield pieces. 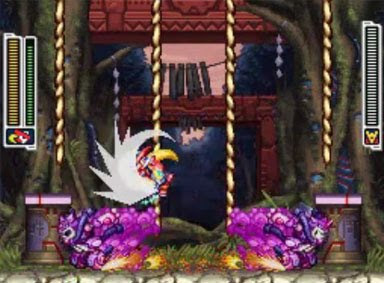 It moves up and down, going off the screen and returning near its exit point, forcing the player to run away and find a gap to dash back through. He can also fly into the background launch two huge lasers into the foreground. After a while, he will rebuild his shield and float back into the air, and the pattern will repeat.